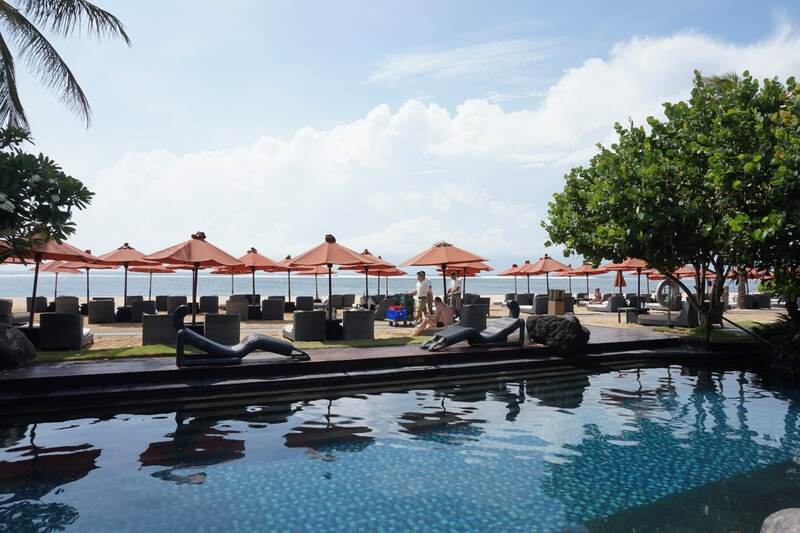 From jaw dropping villas to exquisite dining, the St Regis Bali offers a bucket-list worthy experience and should be booked before the price goes up in March. 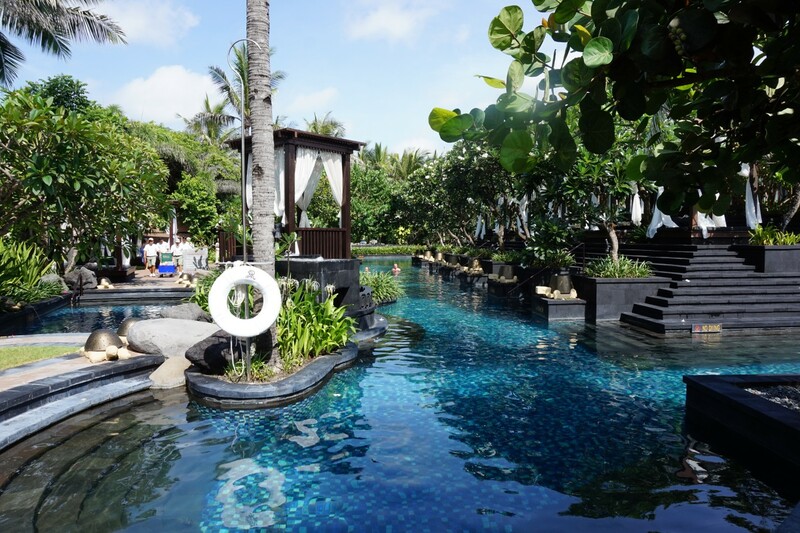 The Mileymoon had begun, and our first stop was a quick three night getaway to Bali. I had already booked two free nights at the Banyan Tree Ungasan using the welcome gift that comes with the AMEX Platinum Charge card, and for the remaining night I decided to review the St Regis Bali, so loved by the crowd over on FT.
After the Marriott-Starwood merger there was a mad rush to book Category 8 properties, and it was nigh on impossible to find award space at smaller ones like the W Maldives and St Regis Maldives. 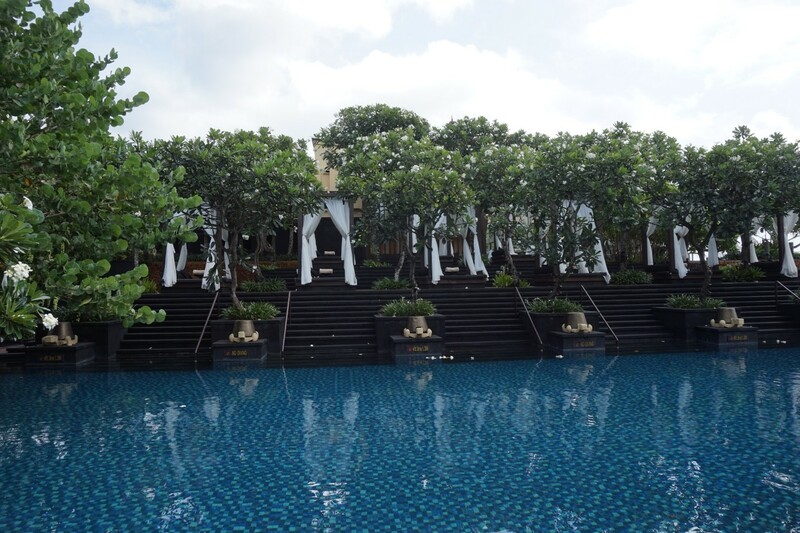 Fortunately, the St Regis Bali is a much larger property (relatively speaking) and it’s still fairly easy to redeem award night stays. You can do this directly on the Marriott website, without the need for CS intervention. 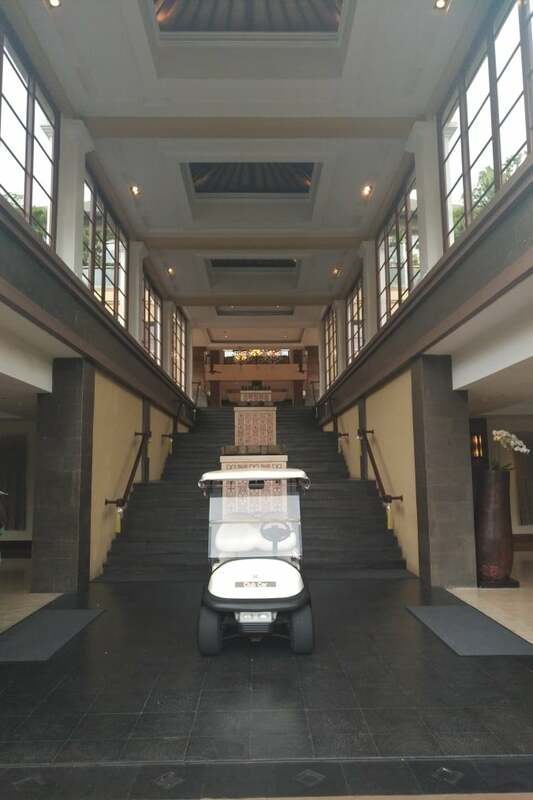 Update 20/2: Sadly, it appears that the St Regis Bali no longer offers complimentary airport transfer and fast track for guests staying on points. 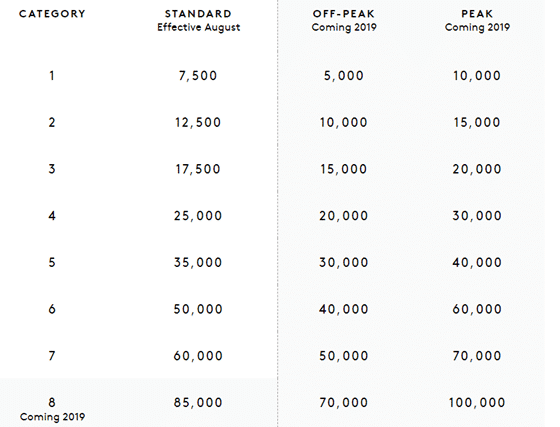 Certain paid rates may still include this. 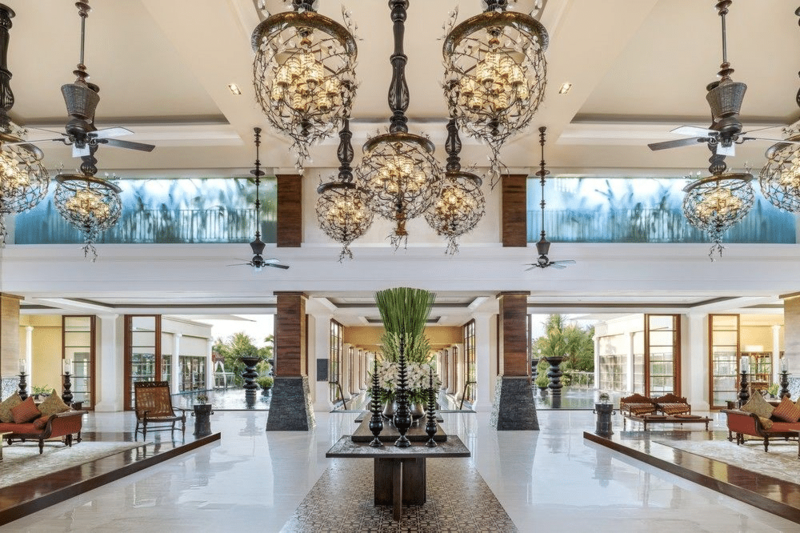 All guests at the St Regis Bali, whether Platinum or regular, whether paying cash or points, will receive complimentary airport fast track and transfers. At an airport as schizophrenic as Bali, this can be a lifesaver- sometimes there are no queues at all, other times the lines can stretch to the back of the arrival hall. Someone from the property will reach out to you before your stay to confirm your flight details, or you can proactively send them over to [email protected] (Marriott, for whatever reason, does not believe in publishing email addresses on the hotel’s website anymore). 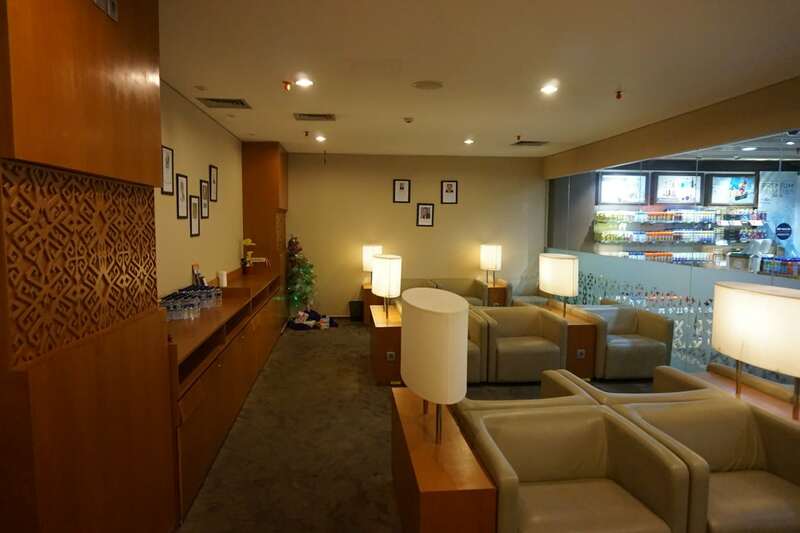 The arrivals lounge was deserted when we got there. 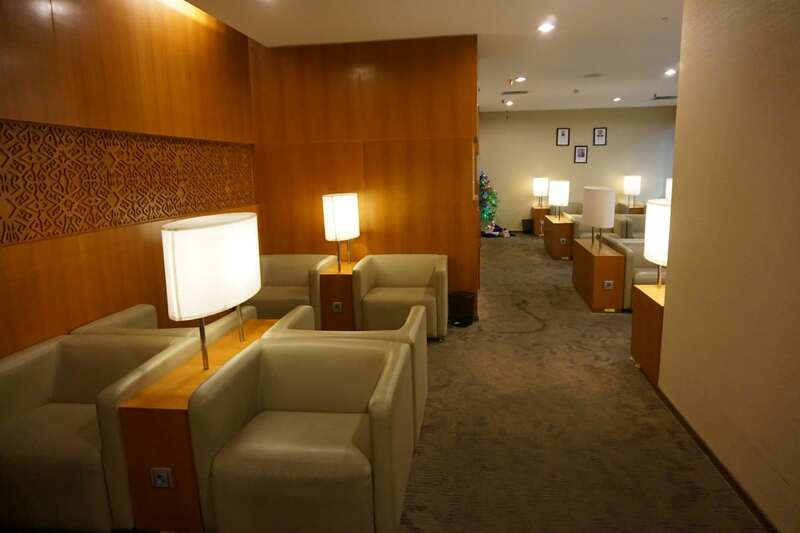 It’s probably a bit generous to call it a lounge, given the sum total of refreshments is bottled water, but it’s still a nice place to sit and wait for your bags to be brought to you. As an added bonus, you can stare through the glass and see tourists paying outrageous duty-free prices ($30 for a bottle of sunblock?). 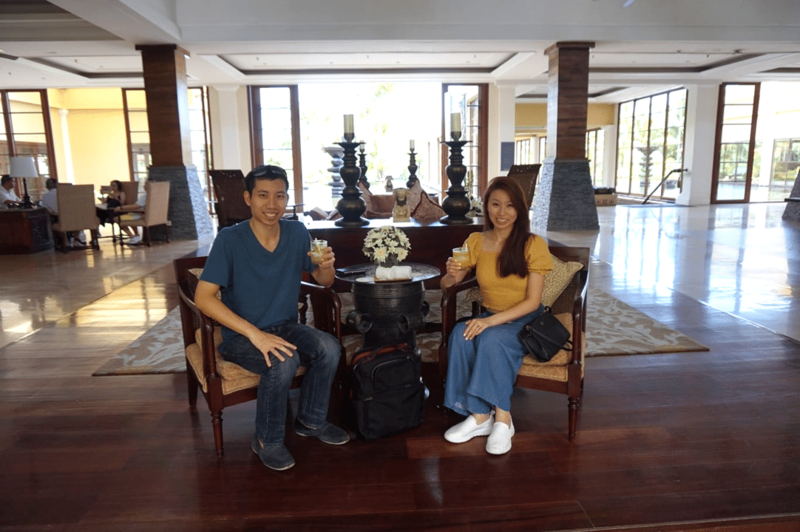 It took about fifteen minutes for our bags to be retrieved and sent through customs screening (you need not be present for that, which always struck me as a bit odd), and after which we were escorted to our vehicle for the 20-30 minute drive to Nusa Dua. 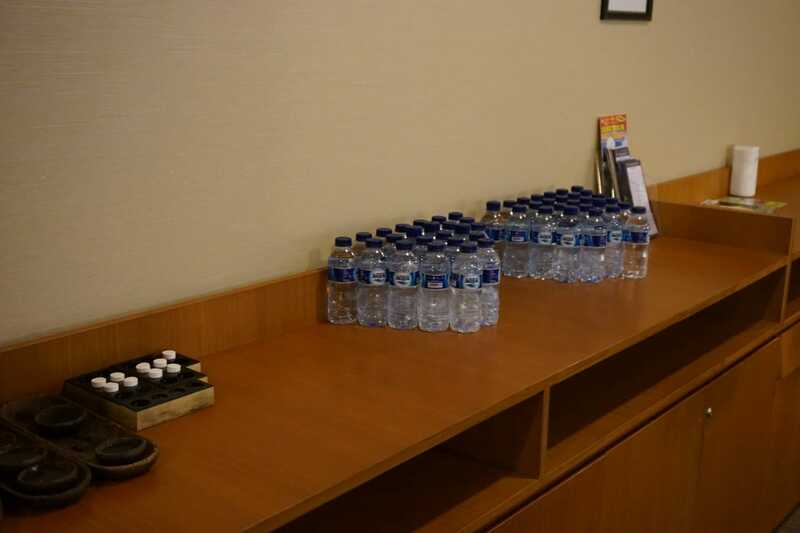 The vehicle was well-stocked with bottled water, cold towels and some tiny St Regis chocolates. 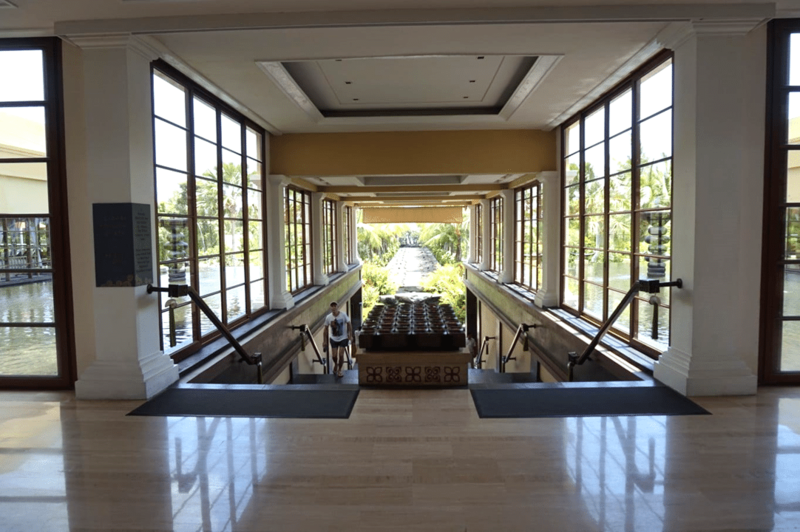 All in all, it’s a fantastic first impression of the resort, which takes care of you from the minute you step off the plane. 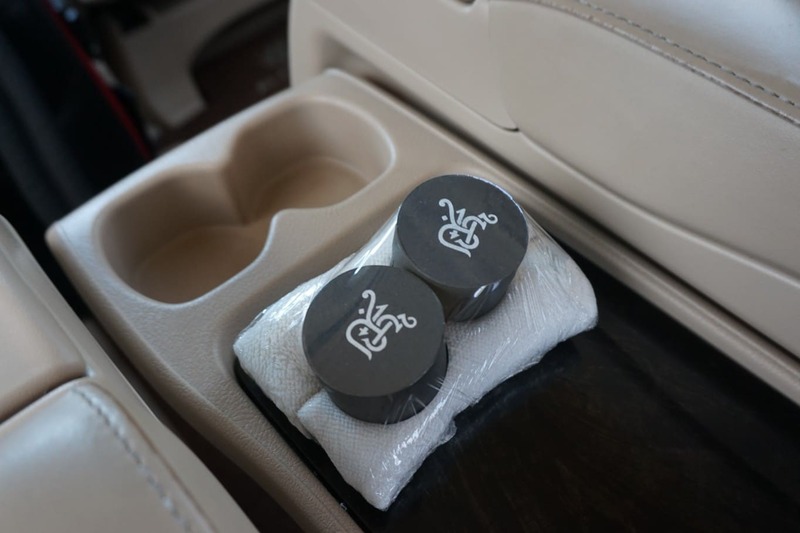 Complimentary transfers are for both arrivals and departures, and if you’re moving to another resort after the St Regis (as we were), they’ll happily drop you off there instead. Alternatively, if you’re staying at another hotel before coming to the St Regis, they’ll arrange to pick you up from there (but you won’t enjoy airport fast track on arrival). 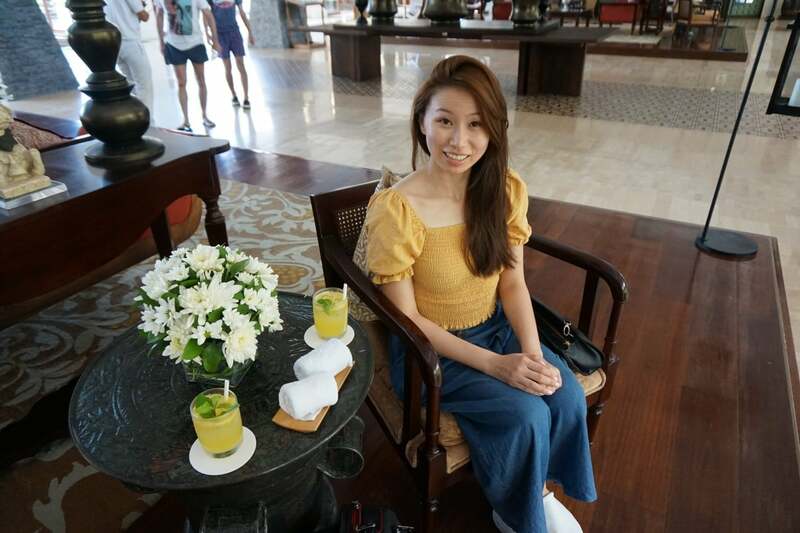 Traffic was kind to us and barely 25 minutes later we were at the St Regis Bali. After passing through a security checkpoint, our car pulled up to the driveway where our bags were screened and tagged. The staff assisting us greeted us by name, which isn’t difficult to do (given that the driver probably informs the property beforehand that he’s inbound) but you’d be surprised how many supposedly five-star properties revert to generic “Sir/Madam” titles. 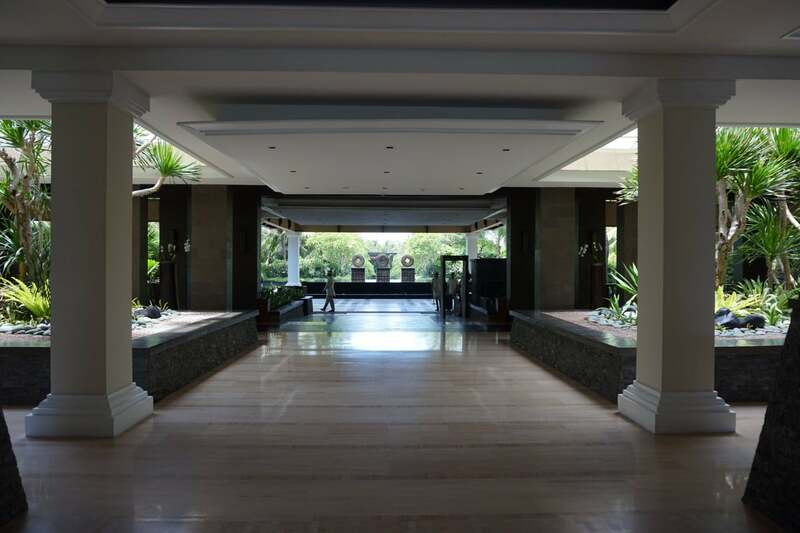 The lobby of the St Regis Bali is bright, airy and open, exactly what you’d expect to find in a tropical beach resort. 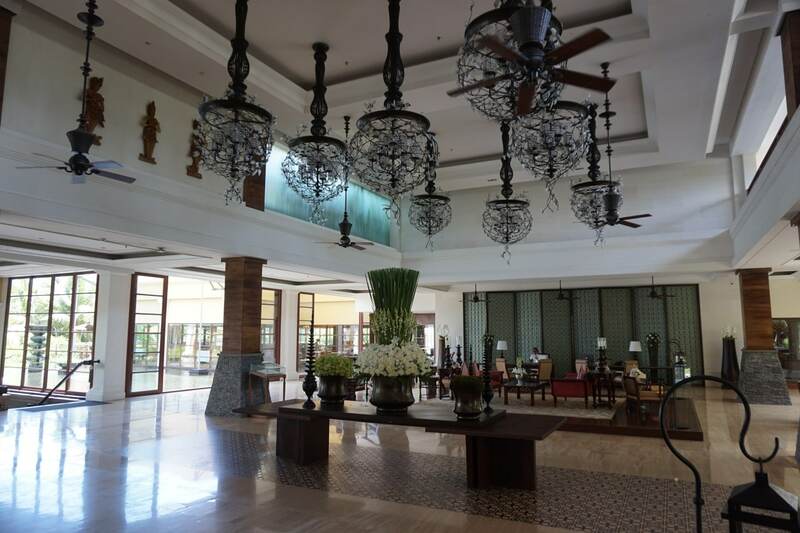 I loved the high ceilings, and the fact that there was a live band playing traditional Balinese music. An associate took my passport and credit card, and we were presented with cold towels and a welcome drink. The Milelioness, evidently not understanding the meaning of needing to take insta-perfect photos, polished off her drink in two gulps. The attentive staff were on this in a flash, and a refill quickly appeared. 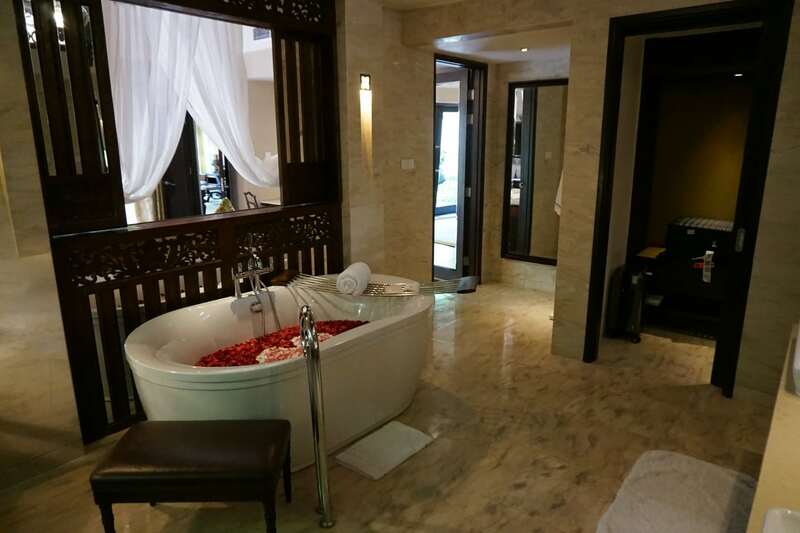 My SNA had already cleared to an Orchid Suite, but the check-in associate told me that we’d been further upgraded to a Gardenia Villa on account of celebrating our honeymoon. 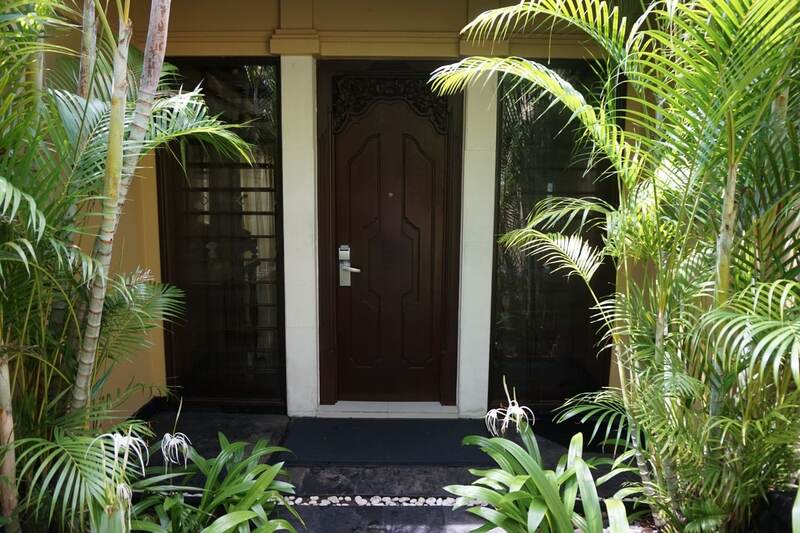 Based on my research of the property, that was exactly what I was hoping for (you’ll see why in just a bit)- I’m sure all the rooms here are nice, but there’s nice, and there’s villa nice. She also asked me to choose between 1,000 Marriott points (the old Starwood program gave the equivalent of 1,500 points, sigh) and complimentary breakfast. Needless to say, everyone staying here should opt for the latter. Formalities done, the Milelioness was presented with a white rose and we were escorted down the staircase to the buggy area. 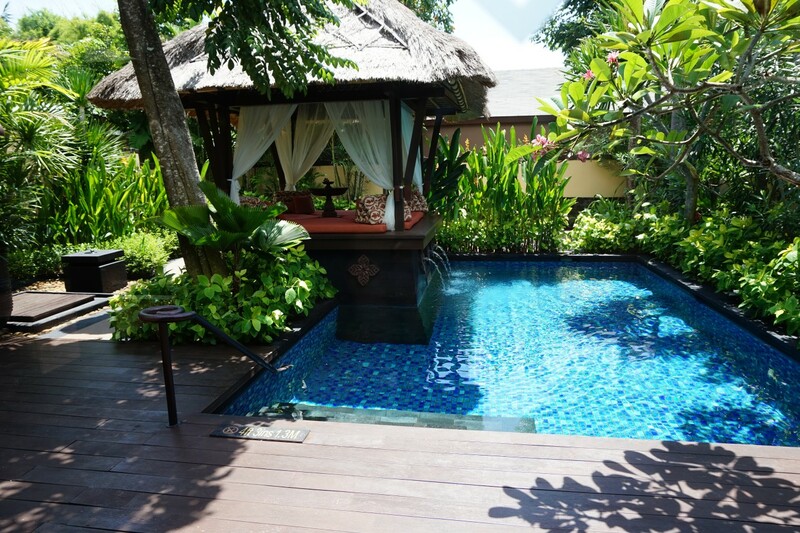 The St Regis Bali has two main types of rooms- suites and villas. 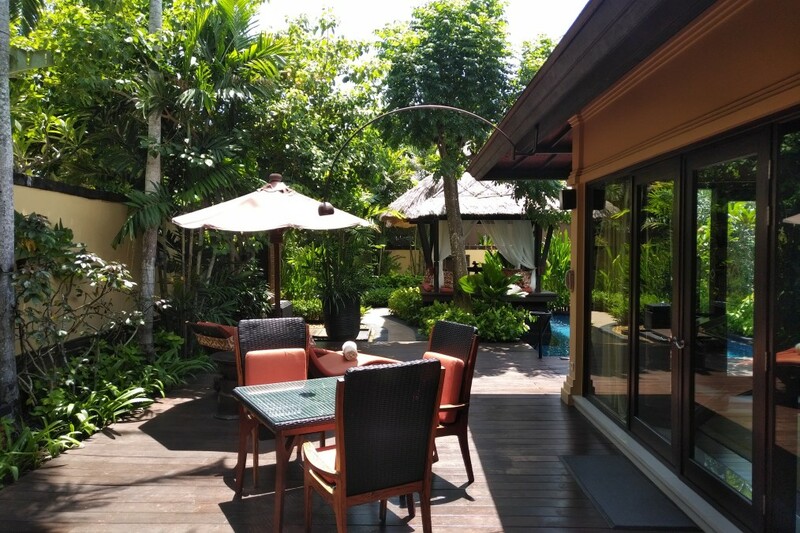 The suites are located in the main building where we checked-in; the villas are scattered throughout the grounds, accessible through a buggy ride (or walk, if you’re feeling energetic). 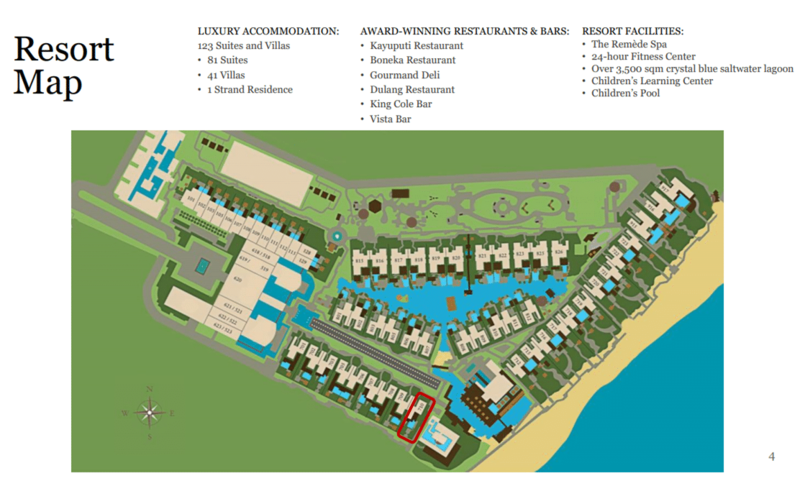 We had been assigned Villa 710 (in red, above), and en route our driver gave us a tour of the resort, pointing out key facilities like the lagoon and main swimming pool, dining options and beach access. 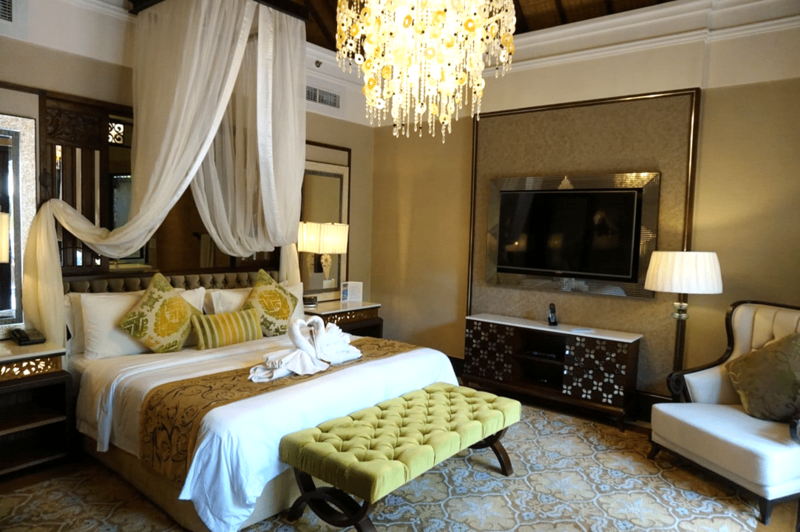 Now, I’d done my research of the St Regis beforehand and knew the Gardenia Villa would be impressive. With a sprawling footprint of 4,424 square feet (1,410 enclosed) featuring a private pool, outdoor gazebo and a bathroom bigger than most regular hotel rooms, it’s hard not to be. And yet, I don’t think anything could have quite prepared me for seeing it live and in person. 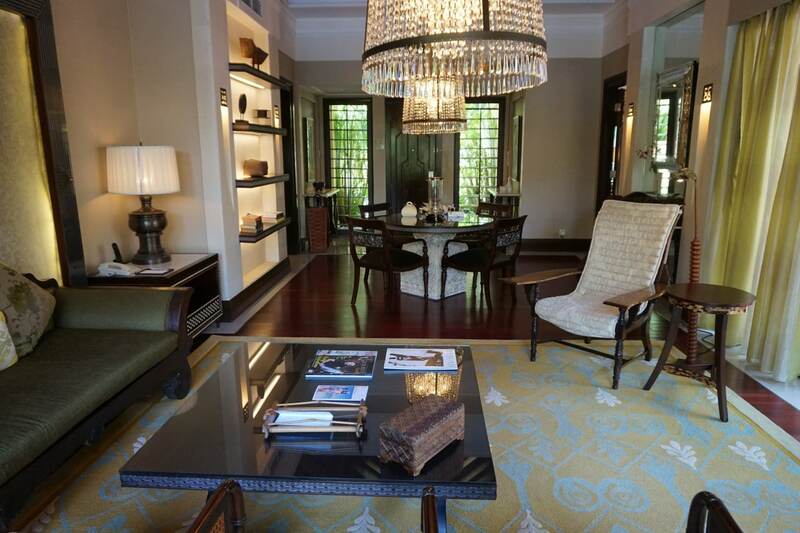 …and the main door opens to reveal one of the most opulent villas you’ll ever see. 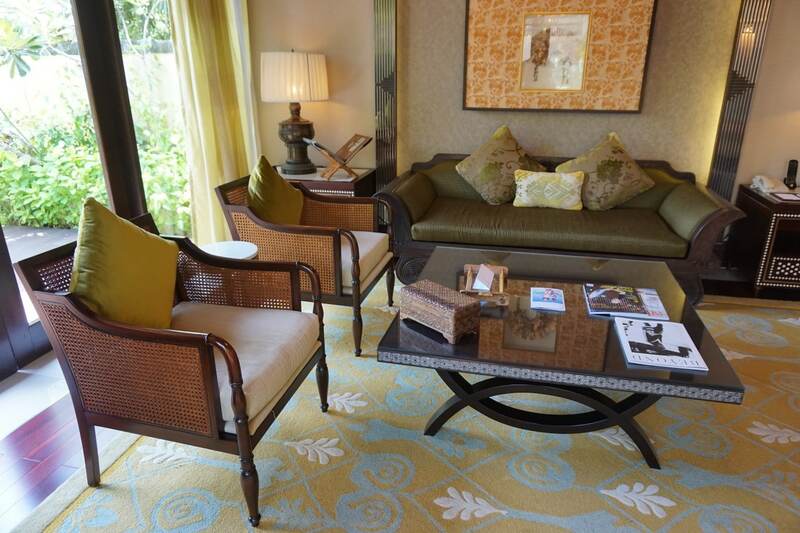 The St Regis Bali opened in 2008, but all 41 villas underwent a refurbishment project that just completed last year. 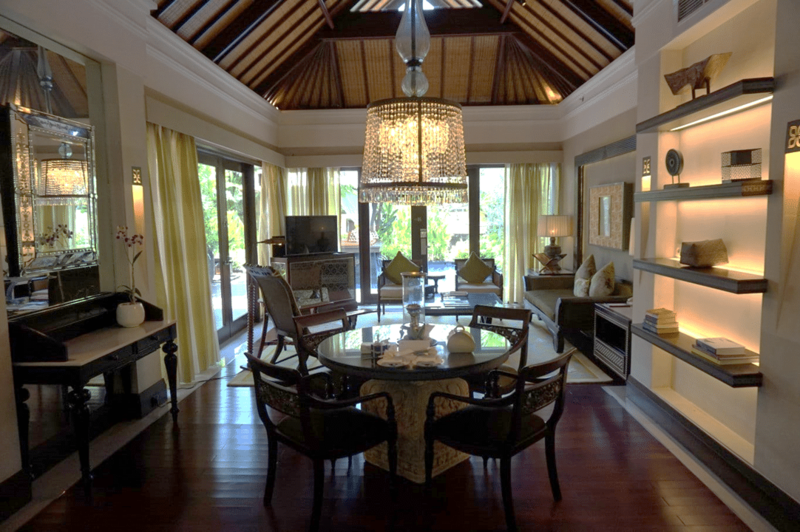 The work seems to have paid dividends, because the villa’s interior looked completely refreshed. 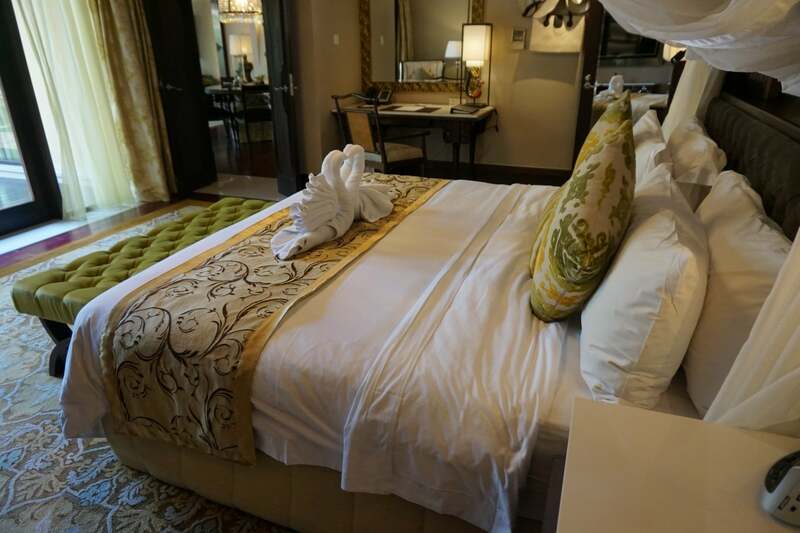 As part of the refurbishment, all rooms also got new 52″ Smart TVs and Bose sound systems, blackout shades and new chandeliers, panels and carpets. The changes are quite noticeable when you look at photos taken a few years back. Here’s a photo taken by Mark from The Shutterwhale when he visited in 2016– note the smaller TV, coffee table and sofa. Strangely, I think it’s the coffee table which really rounds out the room. The coffee table in Mark’s photo is much smaller, and makes the living room space feel underutilized. A small gift was waiting on the dining table. 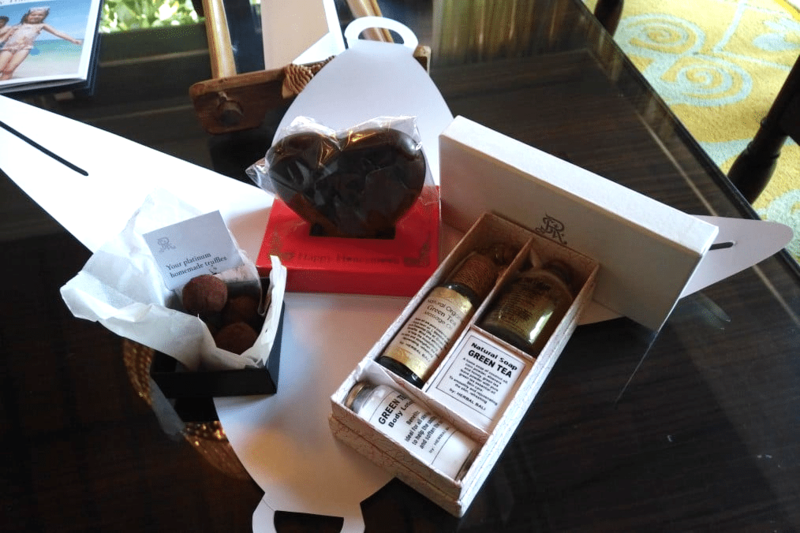 FYI- the chocolate heart is for the honeymoon, the chocolate truffles are for Platinum status, and the green tea gift set is a standard gift for all guests. The living room also contains a guest bathroom and small kitchen. 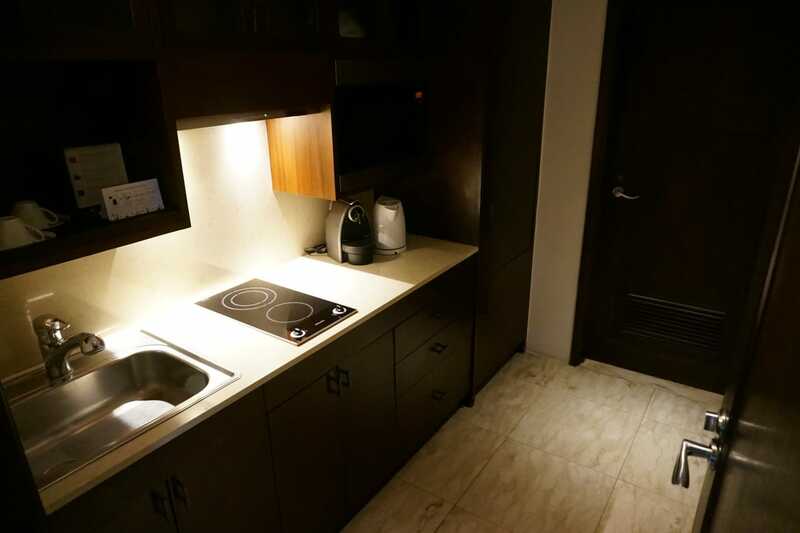 The kitchen does seem like a bit of wasted space, since I can’t imagine anyone comes here to cook. However, there’s also a helper’s room tucked away behind the kitchen, so maybe that explains it a bit. 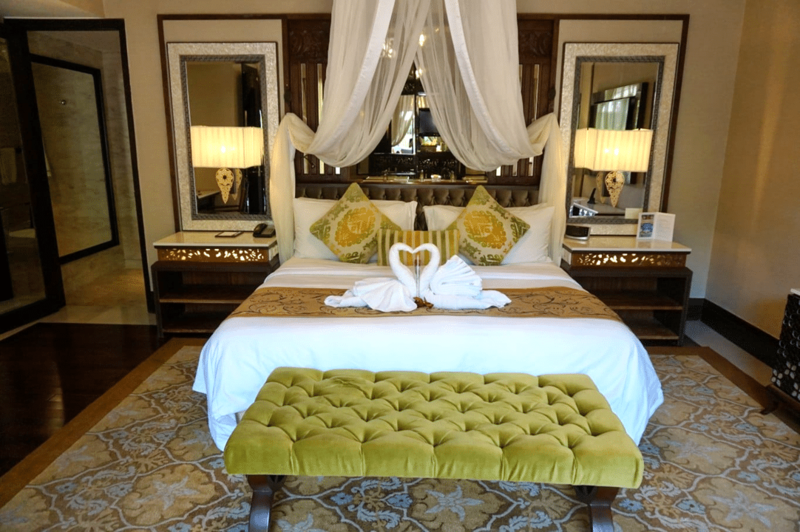 It seemed like every room in this villa was trying to outdo each other, because the bedroom was equally fabulous. I’m going to let the photos speak for themselves, although I will point out that the positioning of the TV is a bit weird. It’s on the left side of the bed, meaning you can’t really watch it without twisting your whole body. 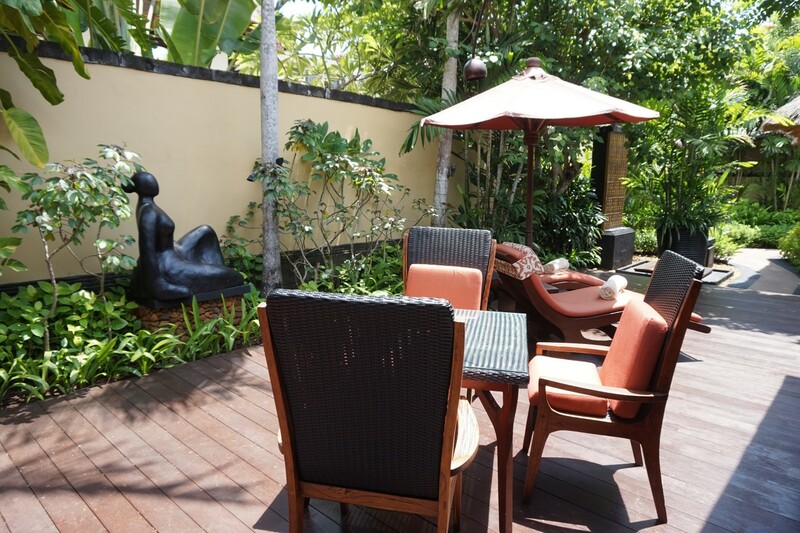 Then again, you’re in Bali, and I don’t think too many guests stay in the villa watching TV all day anyway. 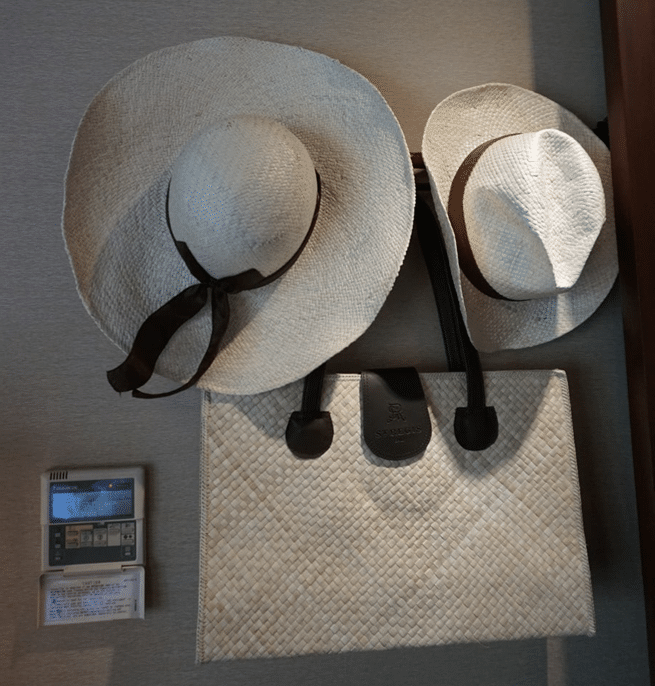 Hanging on the wall of the bedroom was another gift from the St Regis to every guest- his and hers hats, plus a very useful beach bag. They’re yours to bring home. I wanted the bigger hat, but The Milelioness assured me I was big in other ways and gave me the smaller one. 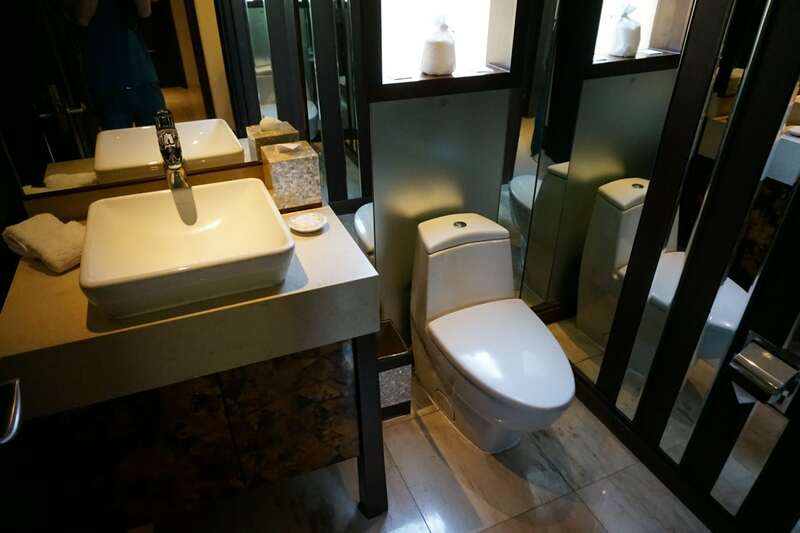 It should probably surprise no one that the bathroom was spacious and elegant, with dual sinks, a full-length mirror, a rose petal filled bathtub, and cleverly enough, a small door with a footpath that led to the outdoor pool. This allowed you to move from the pool to the shower without getting the entire villa wet. 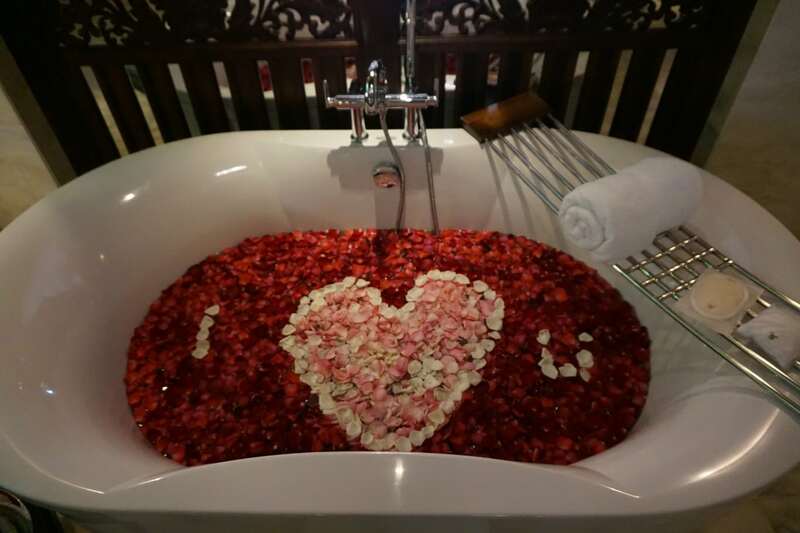 Credit to The Milelioness, who spotted the petals spelled out “I heart you”. I had assumed that some of them just floated off course. 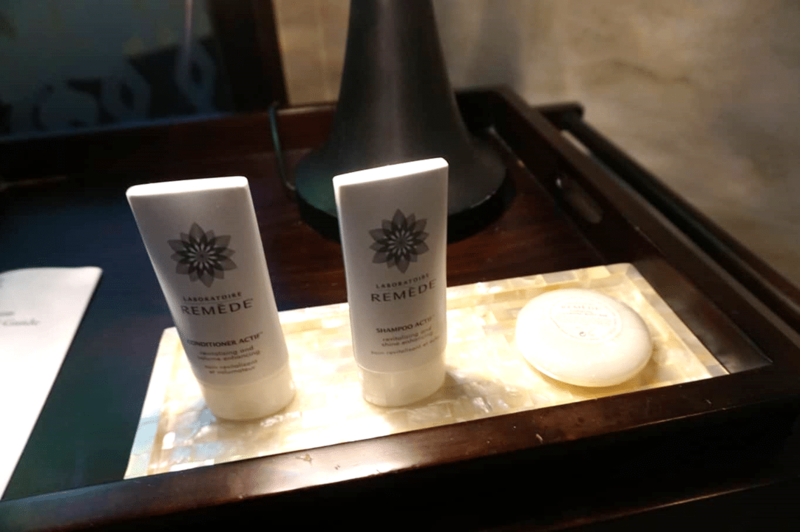 There were two glass bottles of water in the bathroom (plastic bottles are provided elsewhere, strangely), along with the usual Remede Spa toiletries and every manner of bathroom amenity you could possibly need. 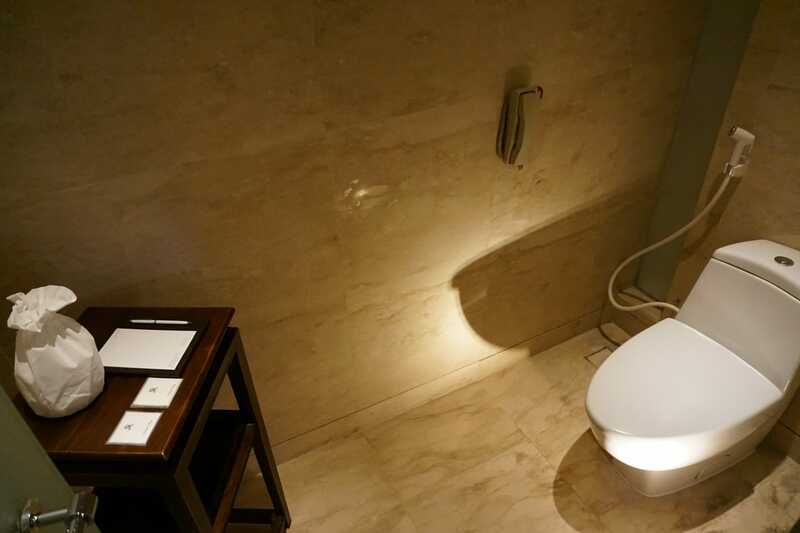 The toilet didn’t have a fancy Japanese bidet, which was a bit surprising for a high end resort, but they at least had the good ol’ fashioned DIY handheld spray. 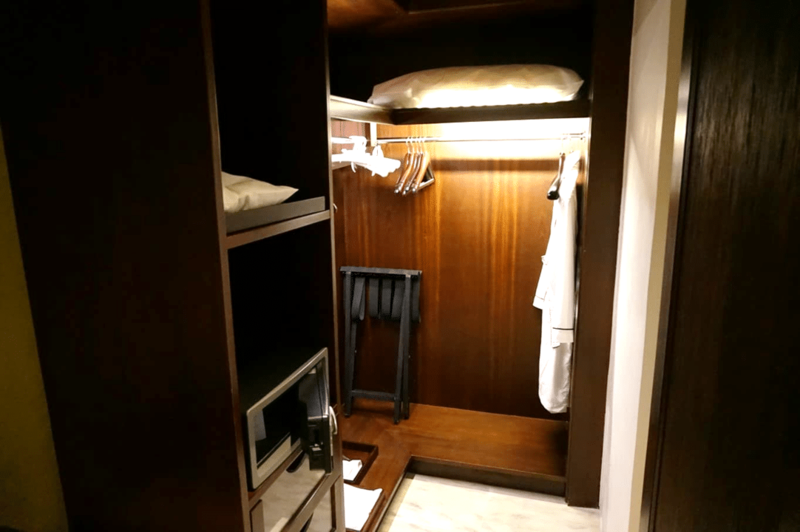 You can bring as many outfits as you want here and still have room to spare, because each villa has a walk-in wardrobe. All that talk and I haven’t even mentioned the outdoor area, with the gazebo and private pool. Outside your villa there’s another dining table if you fancy alfresco dining, a set of lounge chairs, a shower to rinse off when heading in and out of the pool, and of course the main attraction, the pool itself. 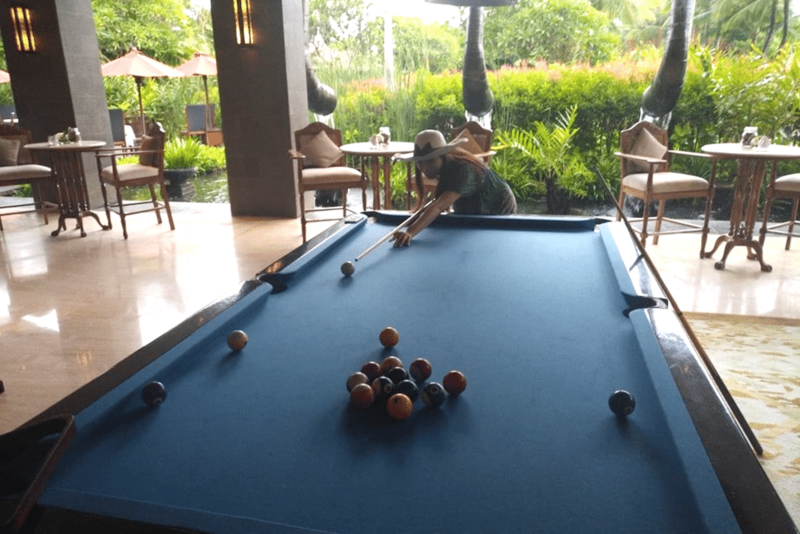 A few words about the pool itself. 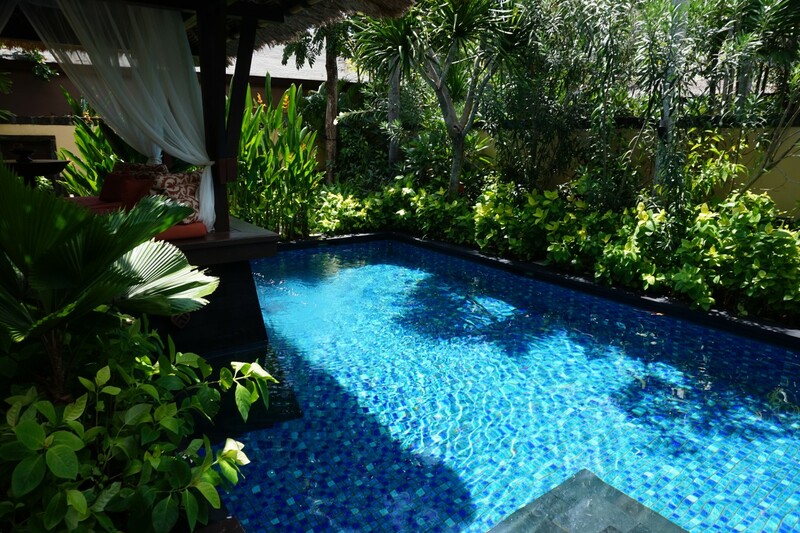 It was awesome to have a private pool surrounded by a private garden with high walls. However, there were some issues that prevented us from fully enjoying it. 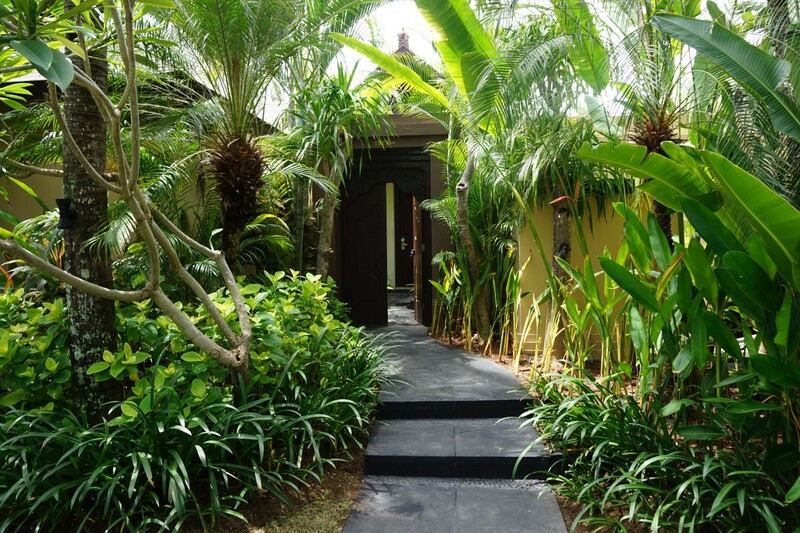 First, there are mosquitoes in the garden, which to be fair has to be expected in a tropical resort. Complimentary mosquito repellent is available in the room, but it didn’t seem to deter them. Second, the water in the pool was freezing cold. It could just be because our villa happened to be in a more shaded part of the resort, but testing the water at various times of the day led to the same outcome. Third, I understand the pool is cleaned daily (in the early morning, so take that as a warning if you like to start the day with a skinny dip), but it was still a magnet for leaves and other debris. It’s hard to see in the photos, but when you dived under the water you could see on the surface a lot of small plant bits floating on the surface. 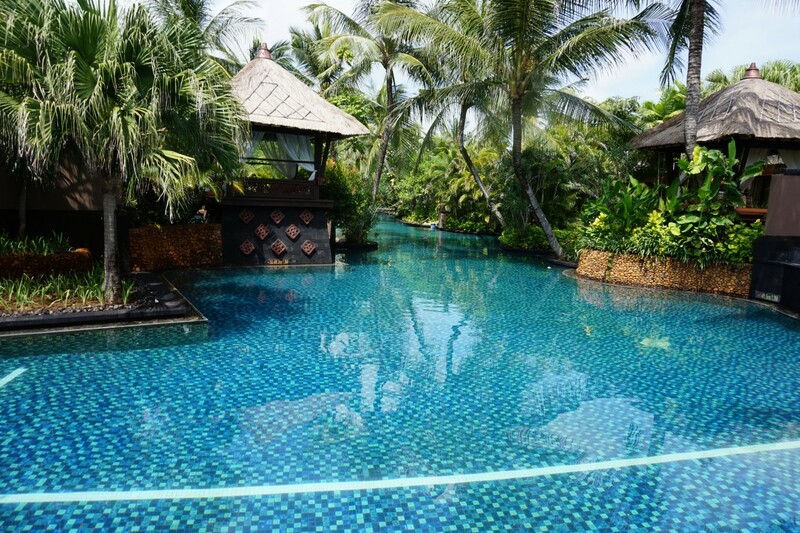 The villa pool makes for great photo taking, but I much preferred swimming in the resort’s main pool (more on that later). 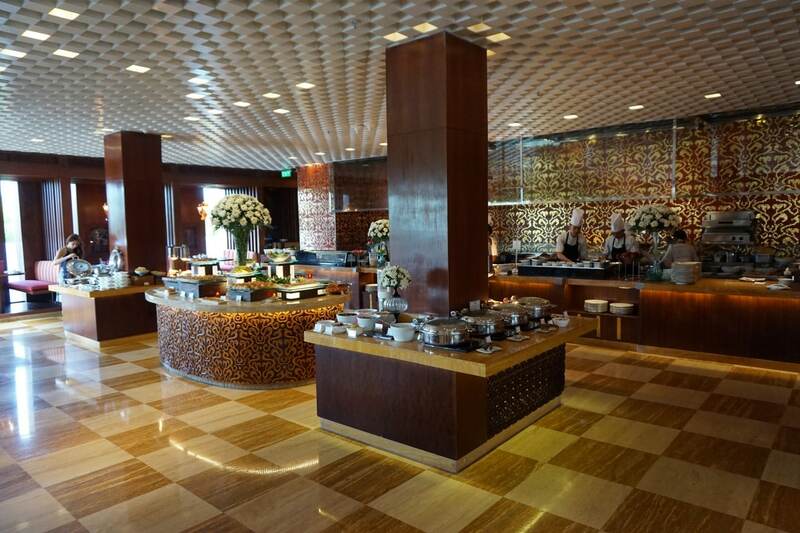 St Regis has a six F&B venues to choose from. 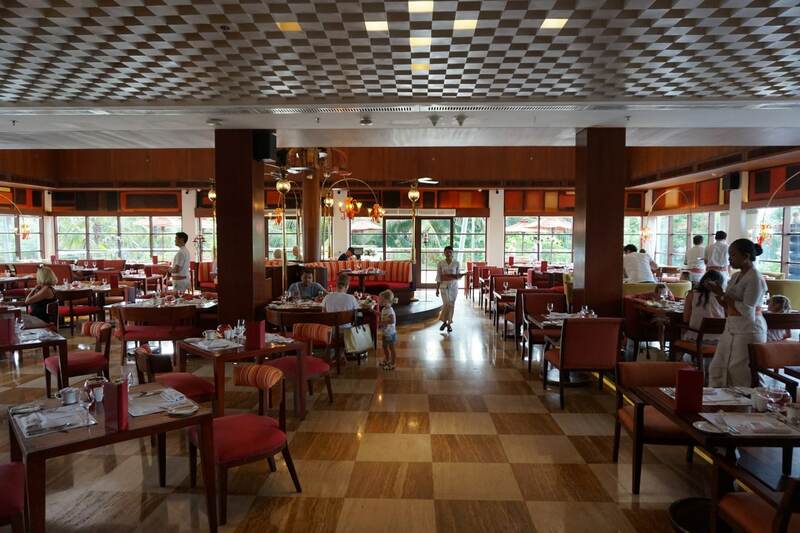 We only had one night at the resort, but managed to visit the King Cole Bar, Boneka and Kayuputi. I’ll just briefly talk about King Cole, because we didn’t spend a whole lot of time there. This is where the evening champagne sabering ritual takes place. 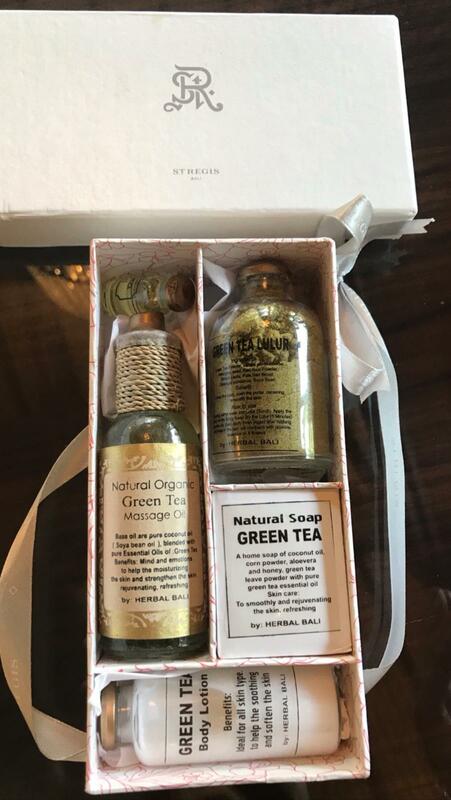 I’ve attended similar rituals at the St Regis Mumbai and St Regis Beijing, and on both occasions everyone got some champagne after the ceremony was done. I showed up hoping for a glass of free bubbles, but after the sabering was completed the bottle was unceremoniously whisked away and never returned. We did have a great chat with the sommelier doing the sabring ceremony, though, and he told us some fascinating facts about champagne and the history of sabering. 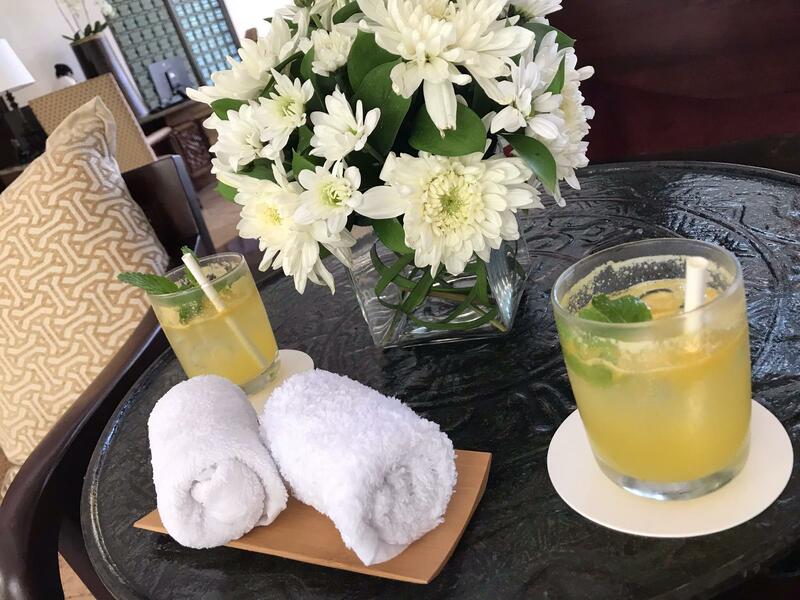 There was some confusion about whether or not Platinum members had complimentary cocktail hours at this resort, because at check-in I was informed about “happy hour”. It turned out to be a more conventional happy hour, where champagne and other drinks were made available at a discount (but still way too expensive). The King Cole bar is also the place to watch the nightly fire ritual at 6.30pm, but since it was raining the evening we were there i think they cancelled it. 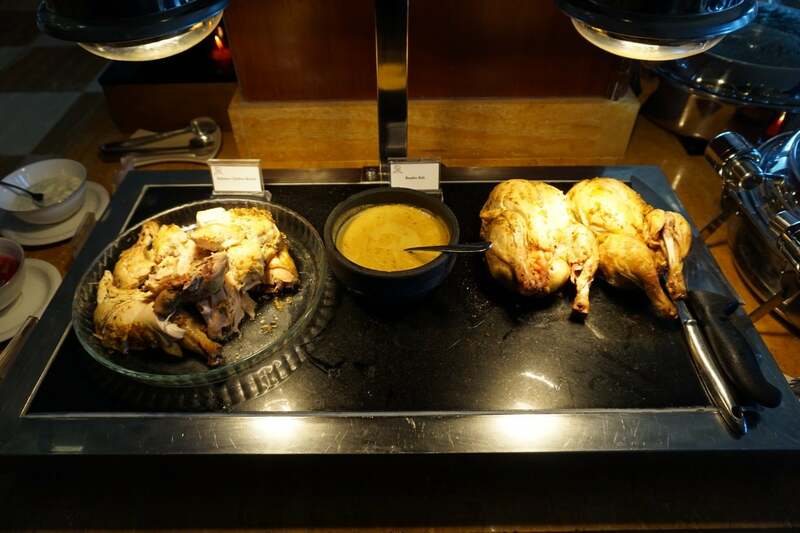 Boneka, located in the main building, is the all-day restaurant where breakfast is served from 7 to 11 am. 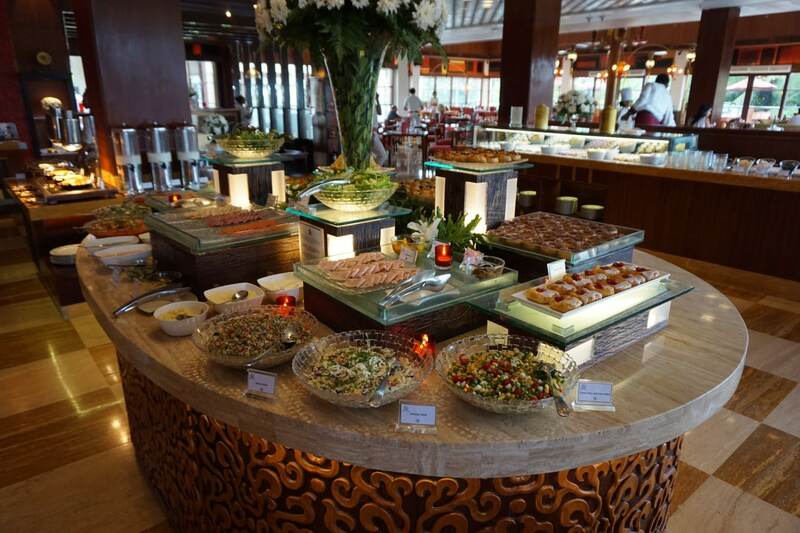 You have a choice of buffet and made-to-order items. 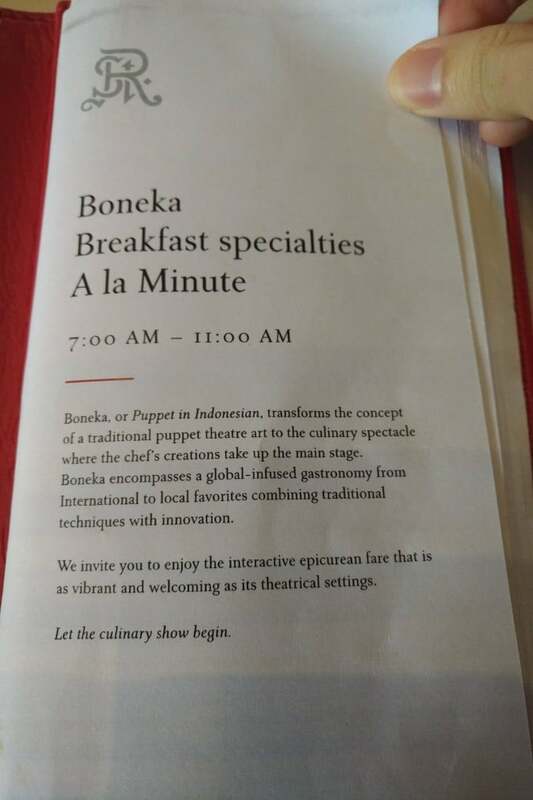 It’s worth noting that honeymooning couples are given the option of taking one morning’s breakfast in the room without the usual surcharge, but I’m sure the selection wouldn’t have been as big and I’m glad we went to Boneka. Can I just get one thing out of the way first? Breakfast was amazing. 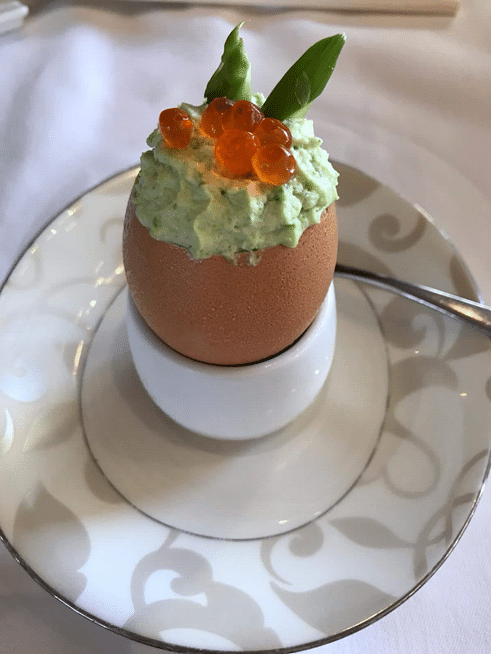 I’ve been to 5-Star resorts around the world and I can tell you I have never had a better breakfast than at the St Regis Bali. There’s no single item I can place my finger on. 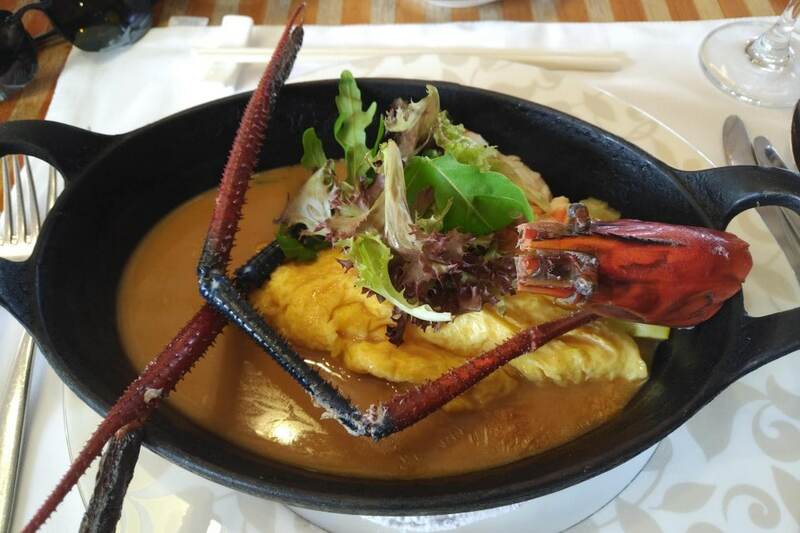 Was it the signature lobster omelette, served with runny eggs, hunks of lobster meat and the most addictive broth? 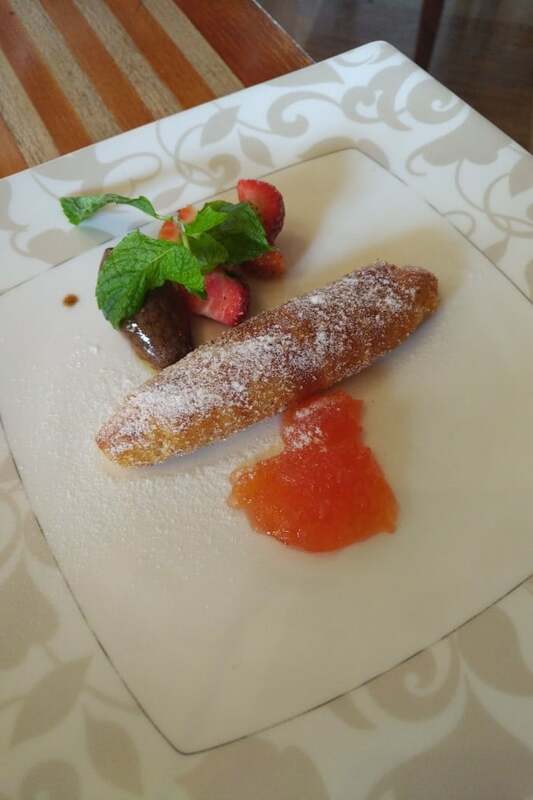 Or the insanely good french toast, crispy on the outside, soft in the inside? Or the decadent foie gras paired with a runny egg for dipping? 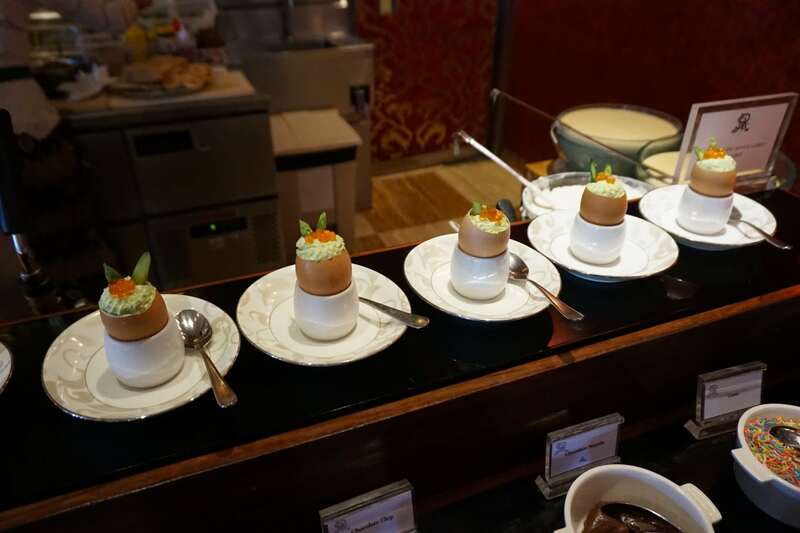 Or the signature egg nouvelle, a lobster ragout filled egg with parsley cream? 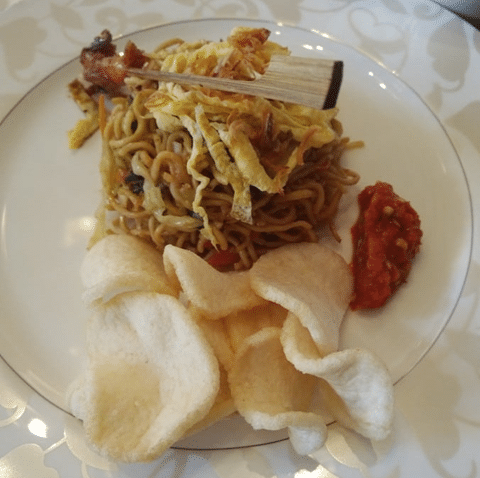 Heck, even the local options like mee goreng were delicious. 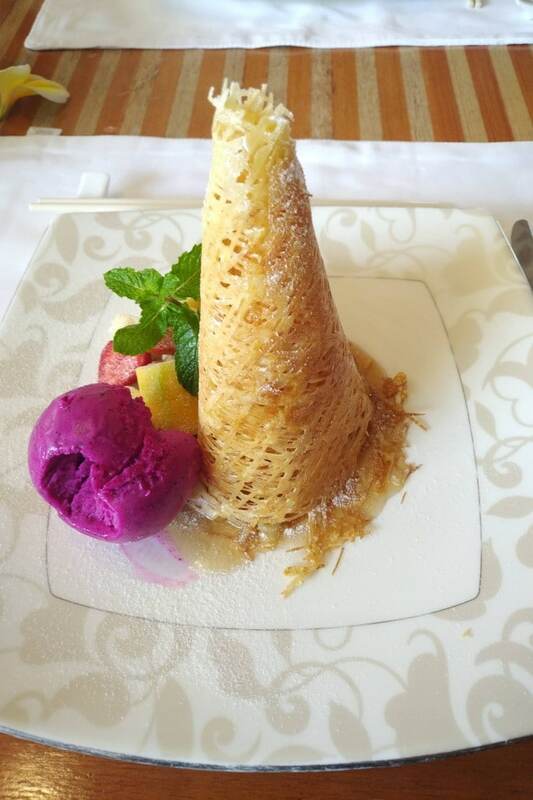 And the chef even whipped us up a unique creation with dragonfruit ice cream, just because. 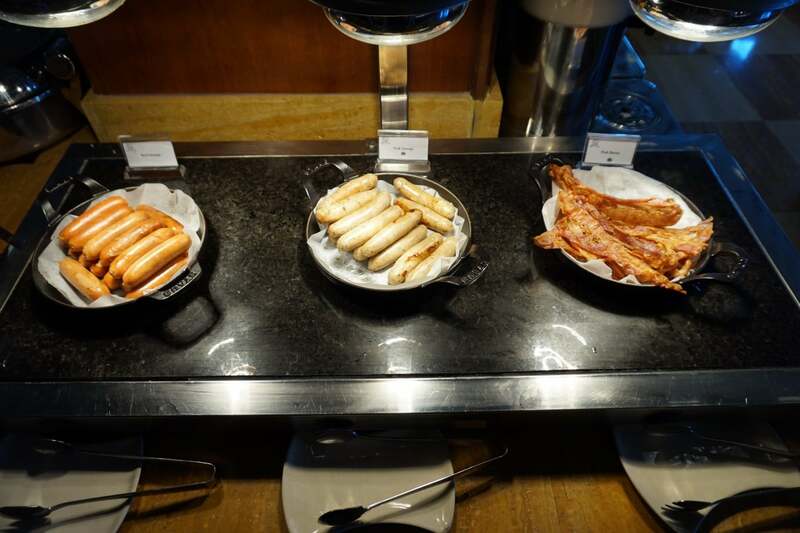 Throughout the morning, the staff walked around with special items from the kitchen. 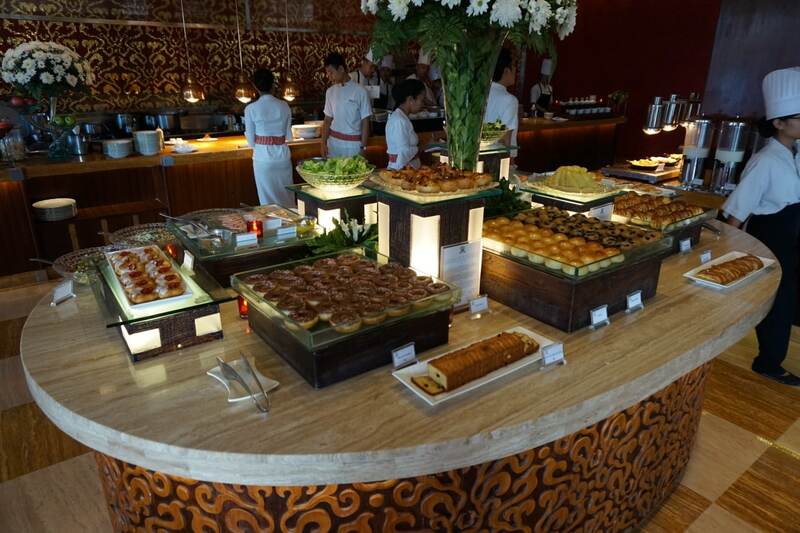 The rest of the buffet was none too shabby either. 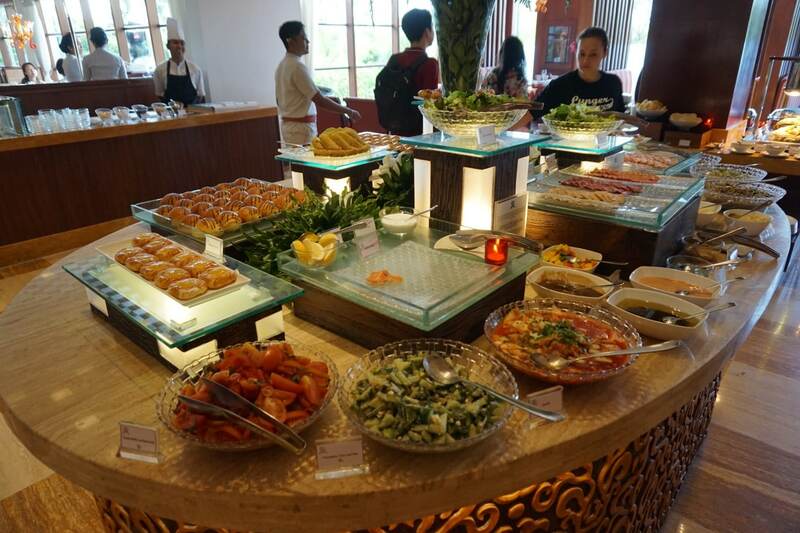 You had both Asian and Western options, cold cuts, salad, various hot items (including pork bacon and pork sausage), a cheese selection, a mini carving station, even an ice cream bar where a chef would mix in your choice of toppings. We only stayed one night, so I have no idea if the items rotate. But even if they didn’t, there’s so much variety that you could stay here a whole week and not get bored. 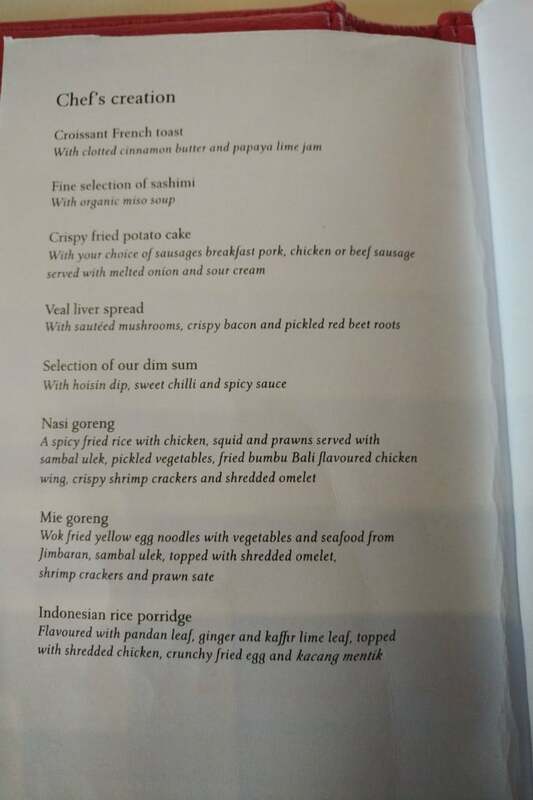 Breakfast costs 450K IDR (~S$43) if it’s not included in your rate, and I would pay that without blinking an eye. 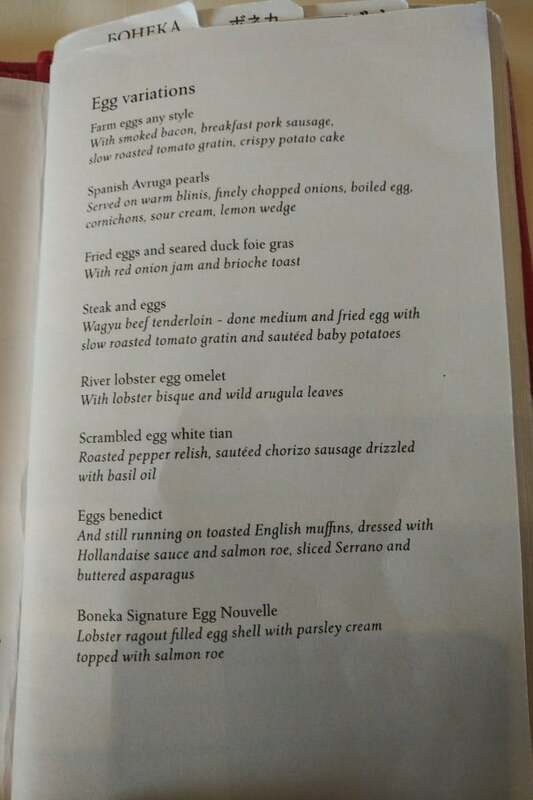 To put things in perspective, I’ve paid more than that for very mediocre breakfasts at some other properties I’ve visited for work around the world. 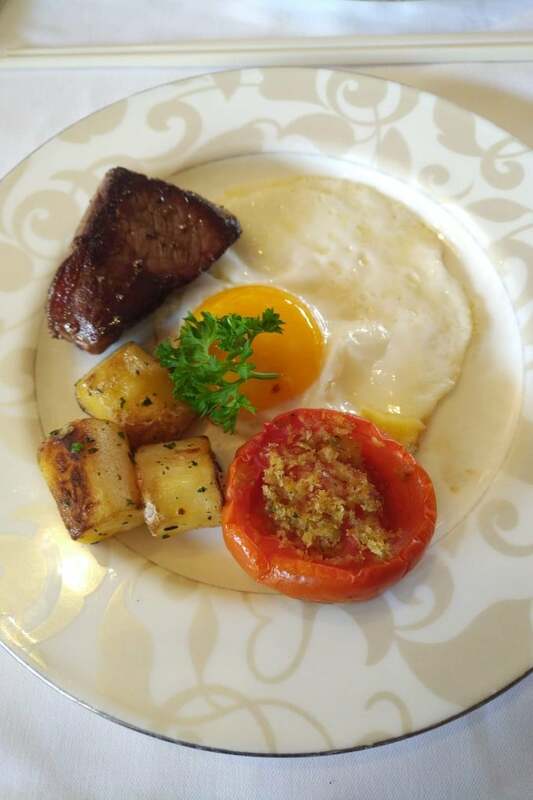 I was so happy with the breakfast experience that I toyed with the idea of journeying from Ungasan to Nusa Dua on subsequent days just to experience that deliciousness once more. 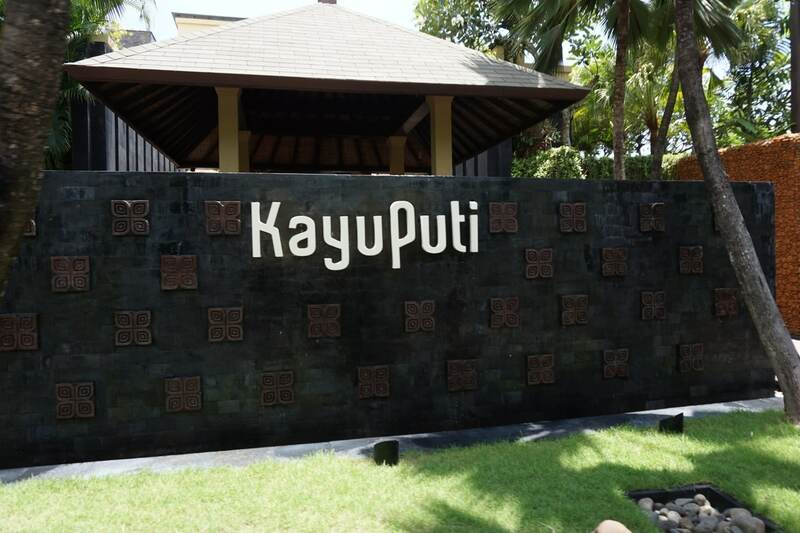 Kayuputi is the St Regis Bali’s “destination dining” option. 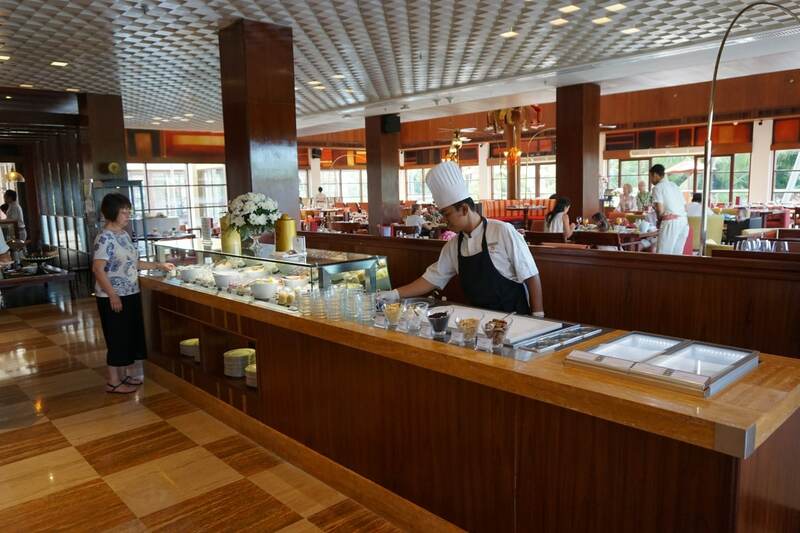 It focuses on fusion cuisine, and is open for both lunch and dinner. 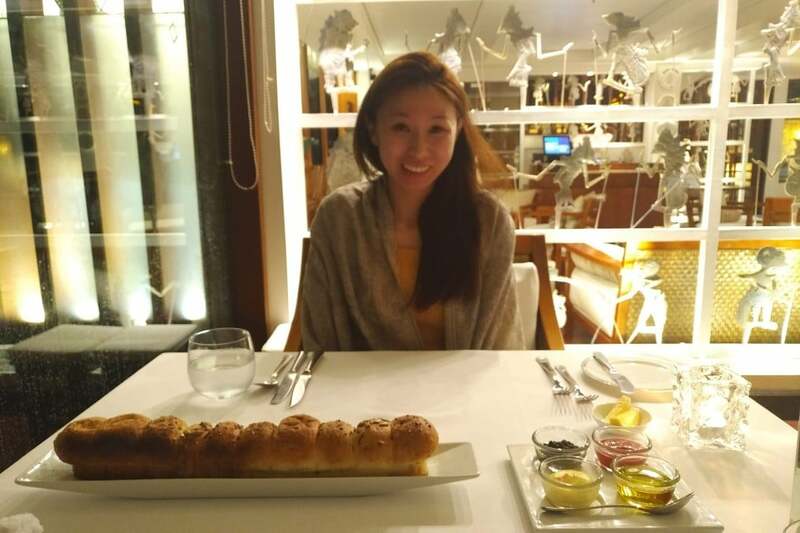 We dined there on our first and only night at the resort. Some people will tell you that Kayuputi is overrated. Some people are idiots. Kayuputi was heavenly. 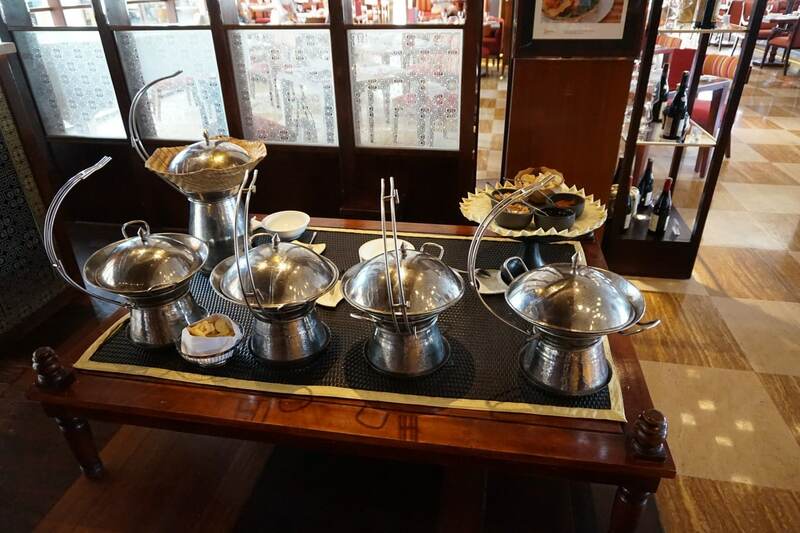 Every single dish brought to our table screamed perfection, and the total damage for 2 people was just below S$200 (without alcohol)- not cheap, but hardly bank-breaking. 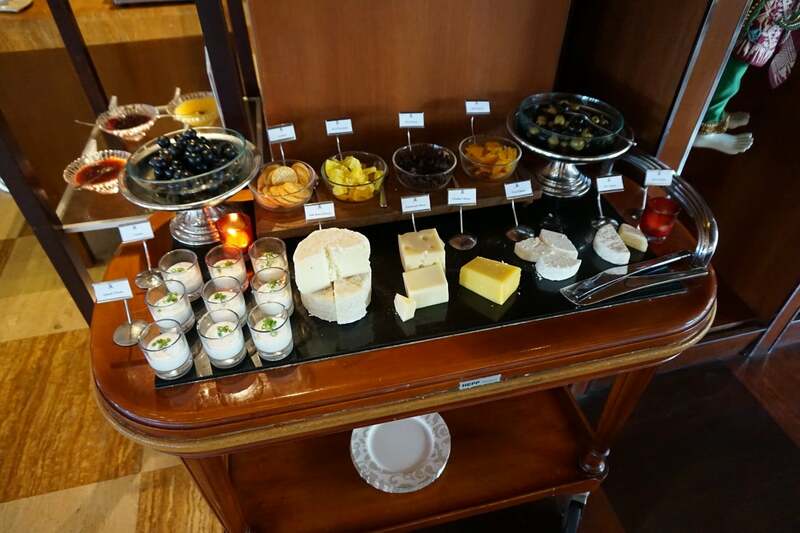 Dinner started with a serving of hot bread and four kinds of spreads. The loaf itself was interesting- you ate it from the outside to the inside, and each segment had a different flavor. 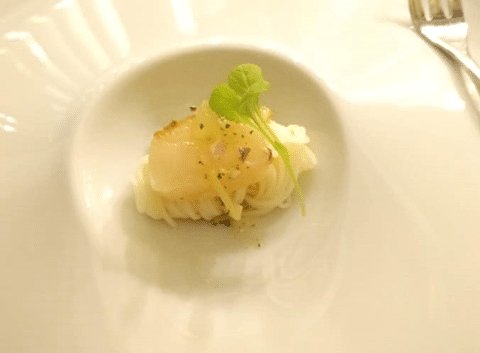 Then came the amuse bouche- a small scallop wrapped in some noodles. 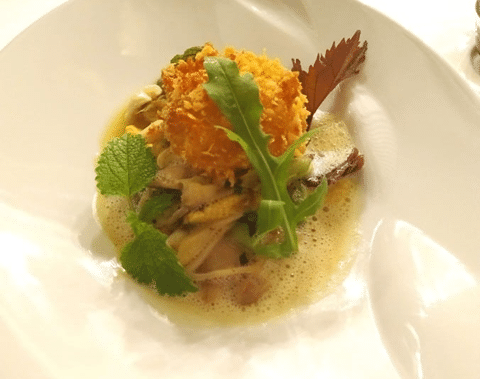 This is the panko fried organic egg with seasonal mushrooms, baby corn and a light curry emulsion (IDR 250K, ~S$24). Although the exterior is fried, slice into the egg and it just gently oozes out, creating a dish with the right mix of creaminess and umami. 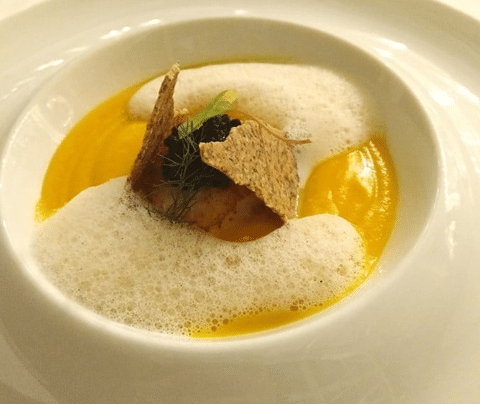 The Hokkaido scallop with ginger infused orange-butternut puree, avruga pearls and “papua” vanilla milk foam (IDR 320K, ~S$31) had just the right amount of char on the outside, yet was tender on the inside. My mom will attest to the fact that I hate gourds (squash, pumpkin, wintermelon) with a vengeance, but I found myself lapping up the butternut pureee, so good it was. This is the Nyegara-Gunung (IDR 720K, ~S$70), the restaurant’s signature dish. 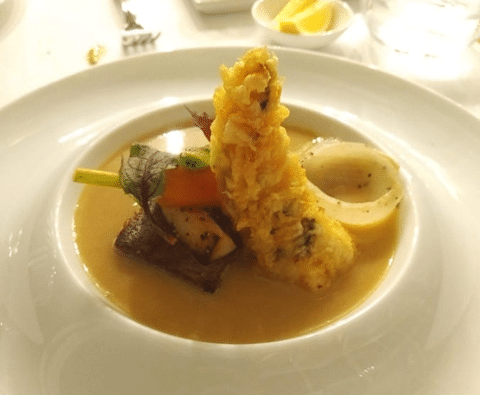 It’s 24 hours of sous vide wagyu beef spare ribs, lobster tail tempura, seasonal vegetable and beef essence. I was worried that 24 hours of cooking beef would make it tough, but the cut held up surprisingly well. The beef broth was also rich in flavor, and had just the right amount of spice. 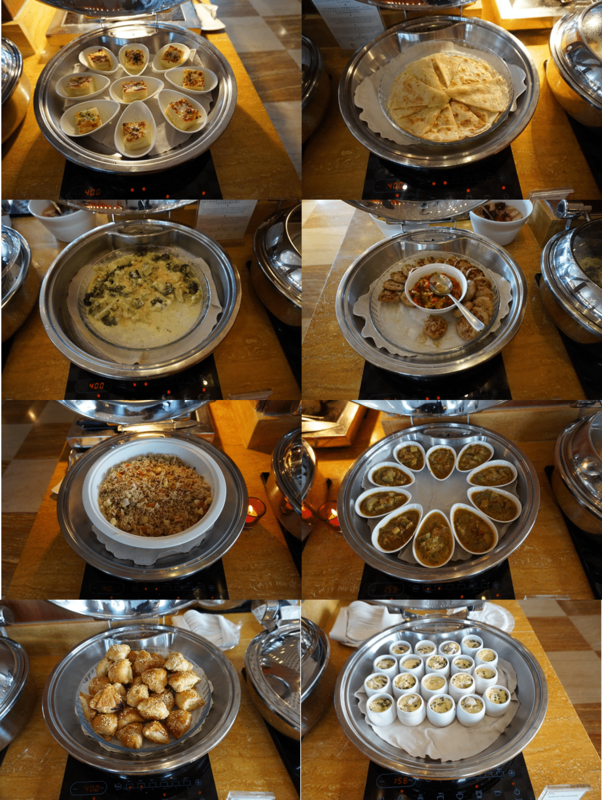 Our other main was the King prawn and octopus risotto (IDR 410K, ~S$40), another triumph. 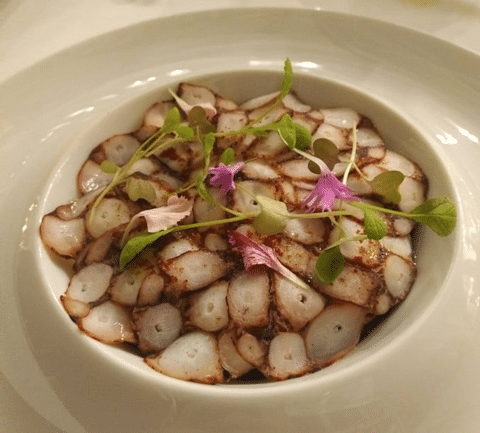 You can’t see it in the photo, but beneath all that thinly-sliced octopus is black rice in a coconut milk emulsion. We had no stomach for dessert, but I’m sure it would have been great too. Fun fact: you can book Kayuputi through Chope, which gives you the chance to earn additional Chope$. When we first arrived, the hotel’s main pool was packed with people and unfortunately, some rather noisy kids. However, the following morning it was totally empty, and that was the best time for swimming. When the pool is empty, it’s a wonderful place to while away the hours. 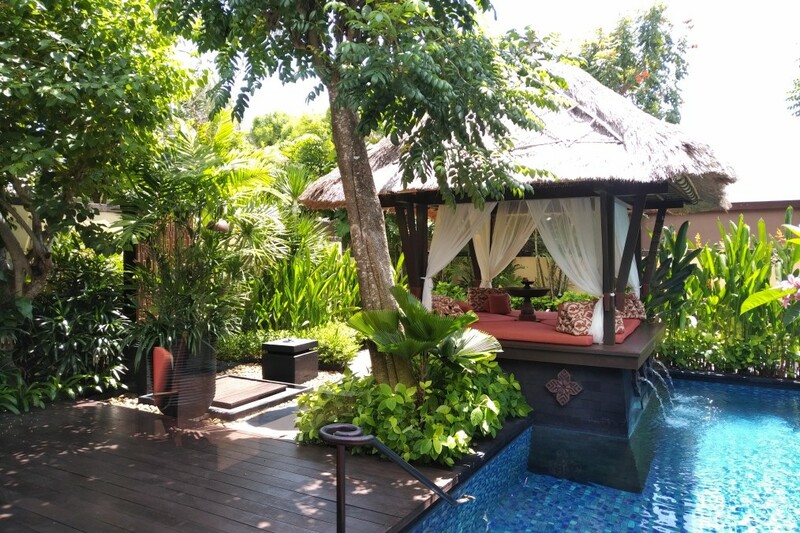 There are numerous private cabanas where you can recline, order a drink and read a book. The staff here were super attentive. 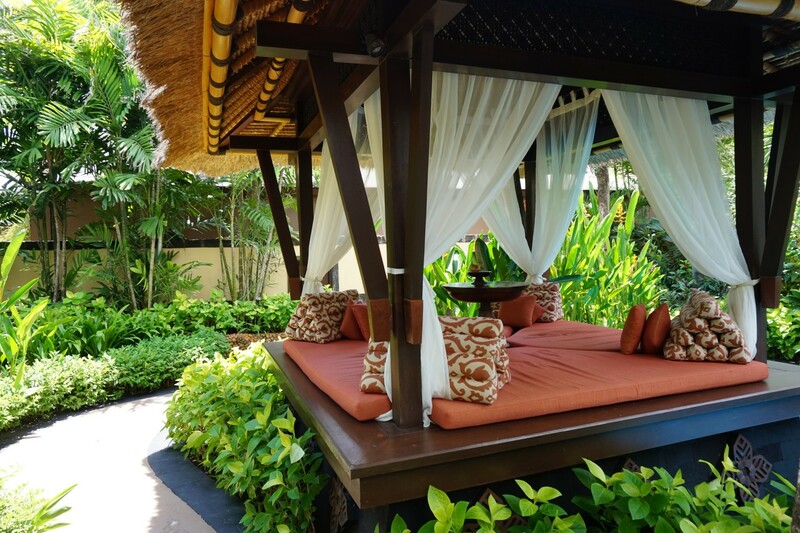 No sooner had we selected a cabana than a team member materialized with two chilled bottles of water and some towels. It had rained the night before, so they carefully laid out the towels so we wouldn’t feel the wet chairs. 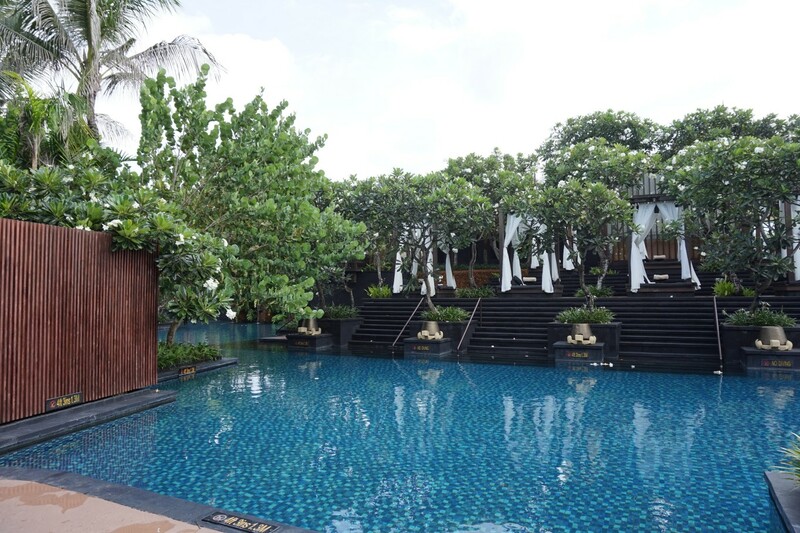 The beach is just a stone’s throw away from the main pool. 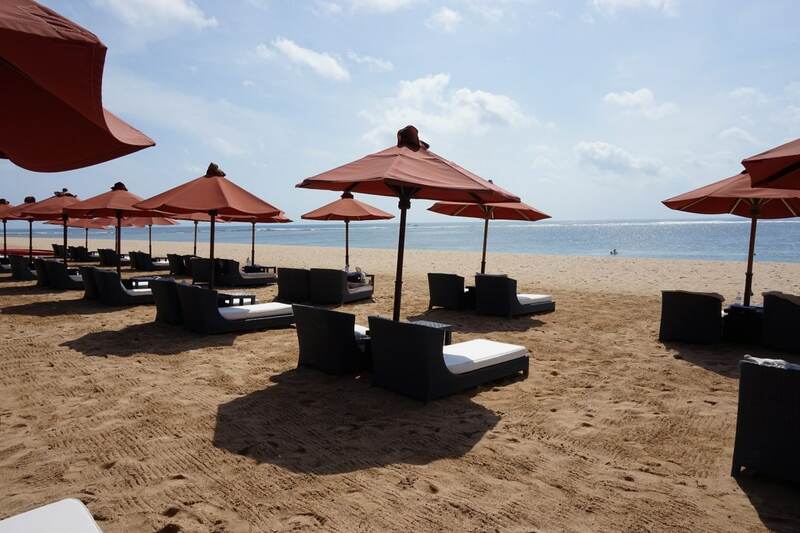 Bali isn’t known for having the best beaches or the softest sand, but at least the beach at the St Regis is a private one, safe from touts and noisy watersports operators. The beach unfortunately faces east, and you won’t get to see any spectacular sunsets (try Jimbaran for that). 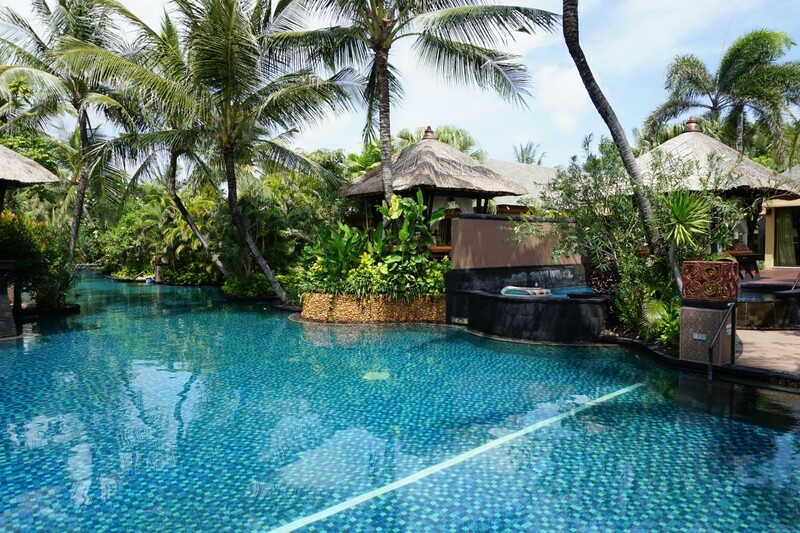 The St Regis also boasts a separate salt water lagoon, along which you’ll find the lagoon villas. I didn’t actually try, but my understanding is the water is salty enough for you to float in it (just don’t get it in your eye (fnar)). 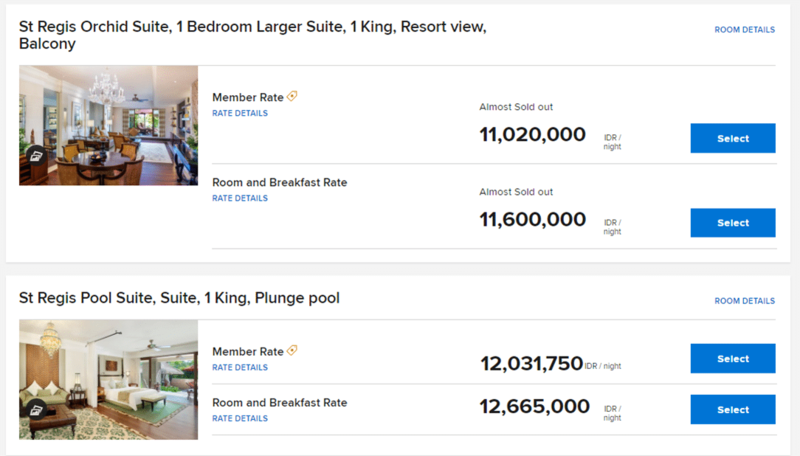 Protip: if you’re on your honeymoon, you probably won’t fancy a lagoon villa. 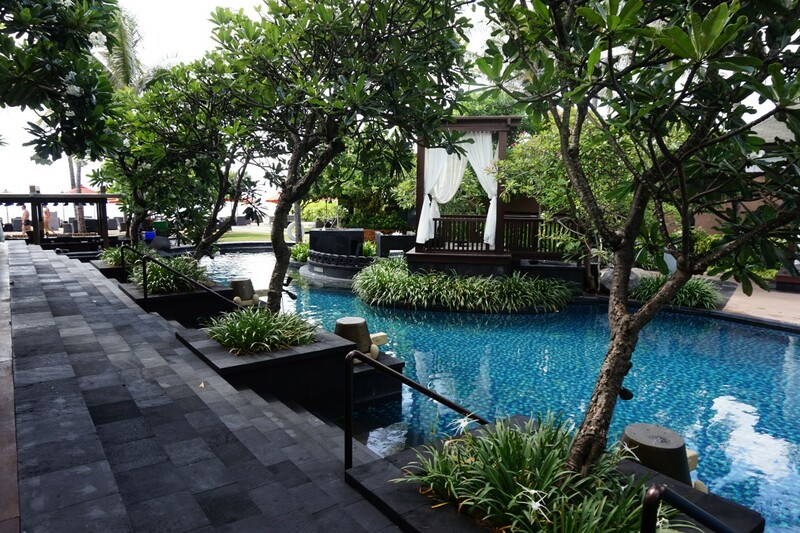 Although as large as a Gardenia villa, these open out directly into the common lagoon. In other words, anyone swimming or walking by can see what you’re doing in your backyard. You know, like playing Monopoly Deal. 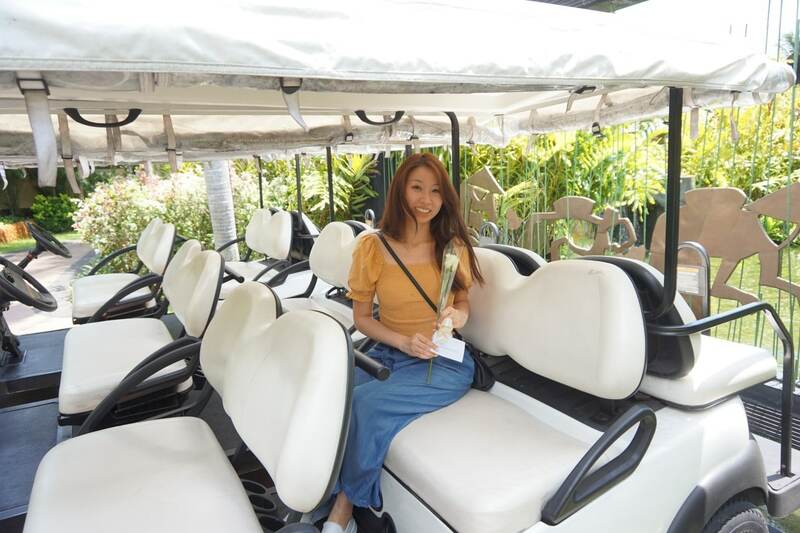 Although you can get around the entire resort by buggy, it’s also entirely possible to walk from place to place, as the ground is entirely flat. 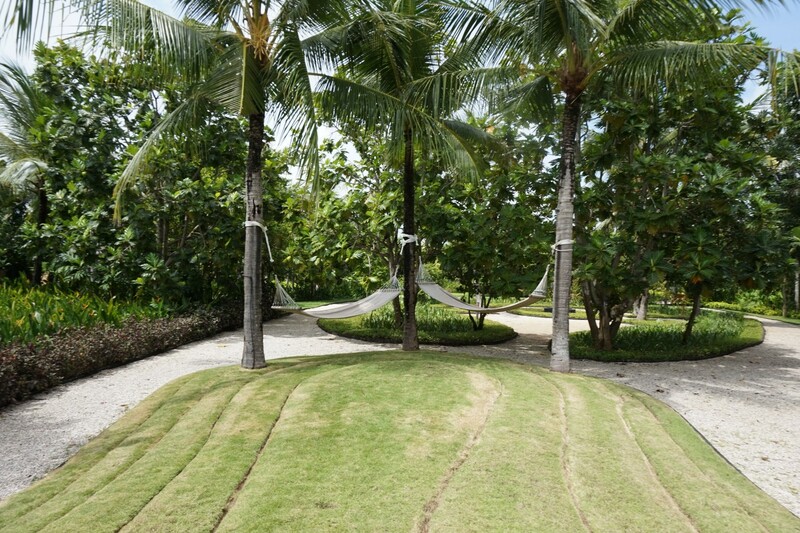 Venturing off the beaten track will find some nice surprises, like this pair of hammocks set up in the garden. There’s also a Children’s Learning Centre which is basically a glorified daycare, a gym, a library and a pool table in the main building near the buggy departure area, where the Milelioness showed me her wicked break shot. 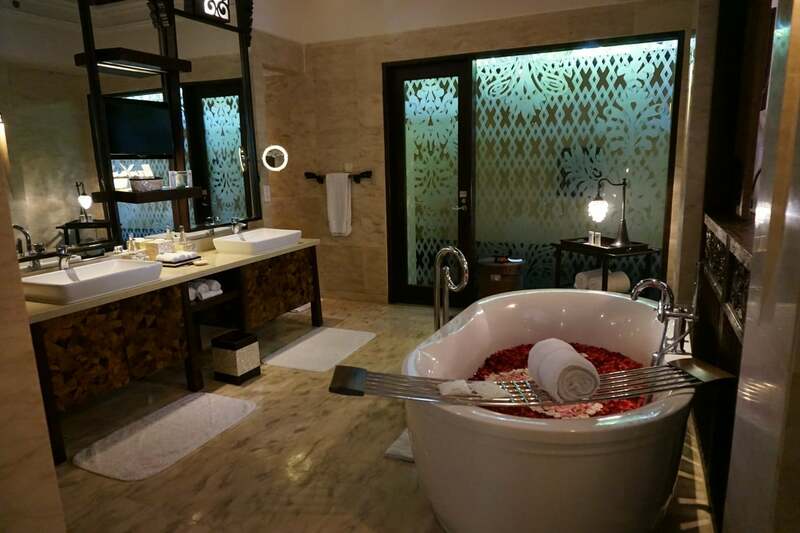 What else can I say about the St Regis Bali? 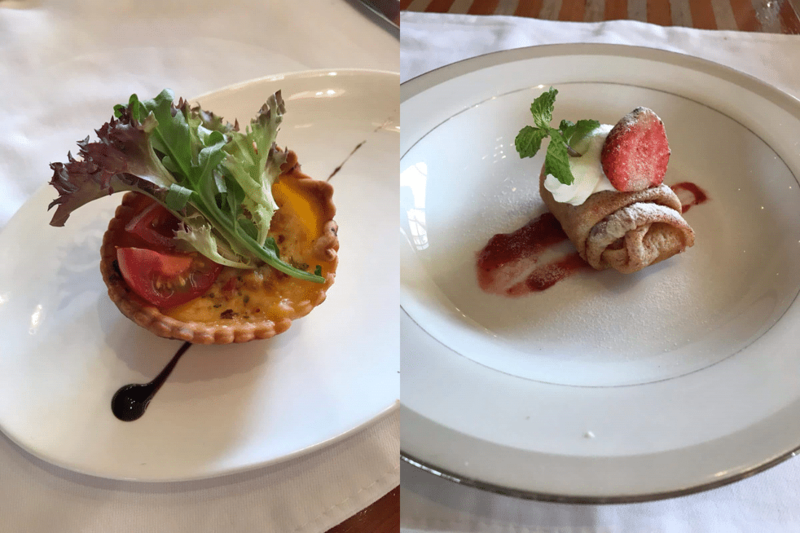 The staff were warm and friendly, the dining was excellent and although the private pool in the villa wasn’t quite how I envisioned it, the luxe interior more than made up for it. My only regret was that we had a single night to enjoy it all. 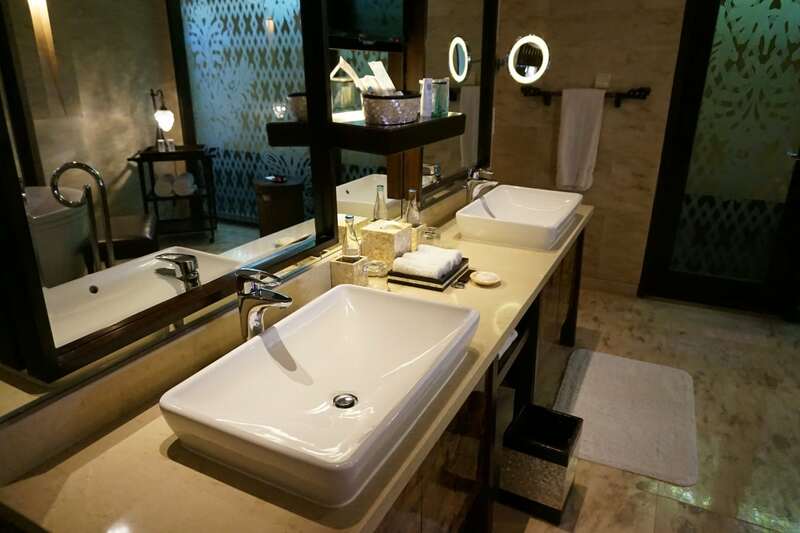 Entry-level rooms here start at US$850++, so chalk this up as another wonderful experience that’s made possible through the magic of miles and points. 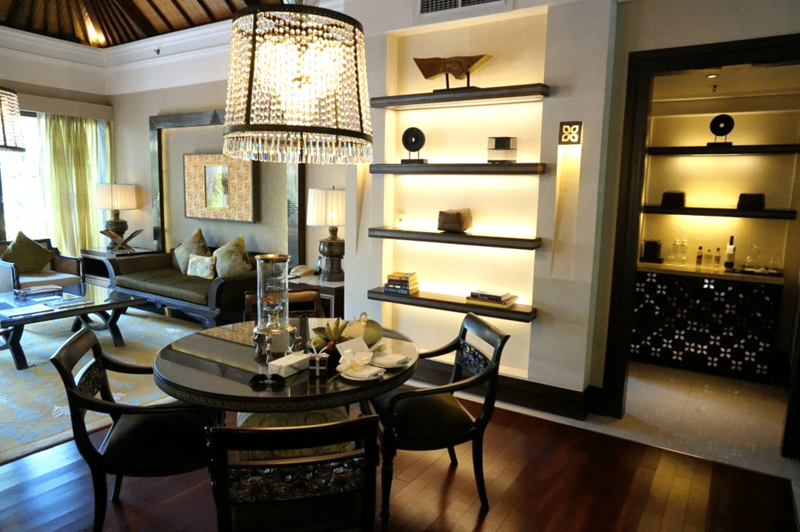 At 60,000 points, the St Regis Bali is an absolute steal, and I’d encourage those of you with the points to try and make a booking before March. Nice! and considering I’m no fan of beaches or resorts, you’ve managed to make me think about it! Still not going.. ha..
Edit: Dunno how “Hall” happened… “Happy Camper”..
Isn’t breakfast complimentary with all rooms or because it’s a redemption booking so no breakfast? Great review! One of my favorite hotels in the world. And the best breakfast by far! Thanks Lennard – will probably make my way there. 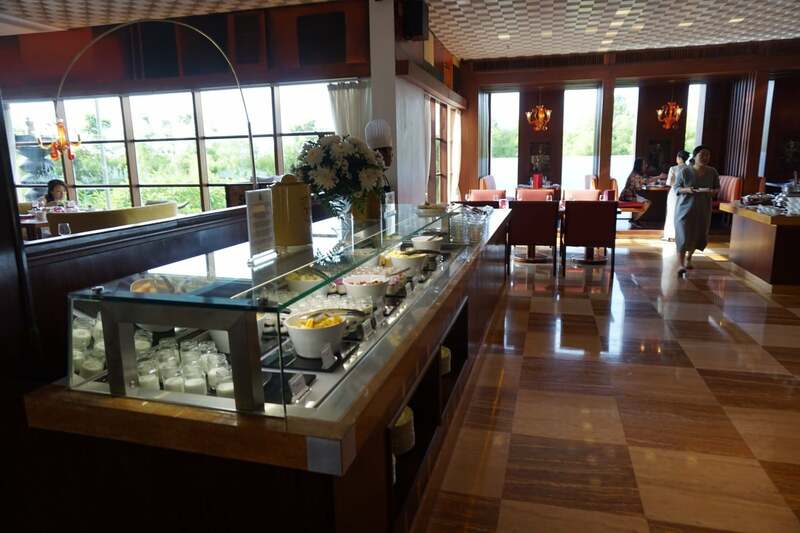 nope – it only says complimentary parking and valet parking. Yeah. 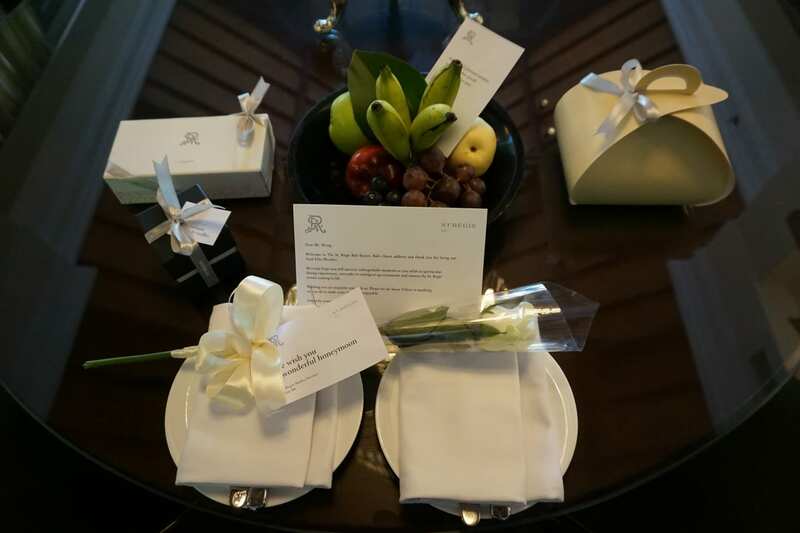 I also had the same reply from St Regis Bali. No complimentary airport transfer for guests. I booked via points redemption. Congrats on the honeymoon and a great stay! All the pictures look great. 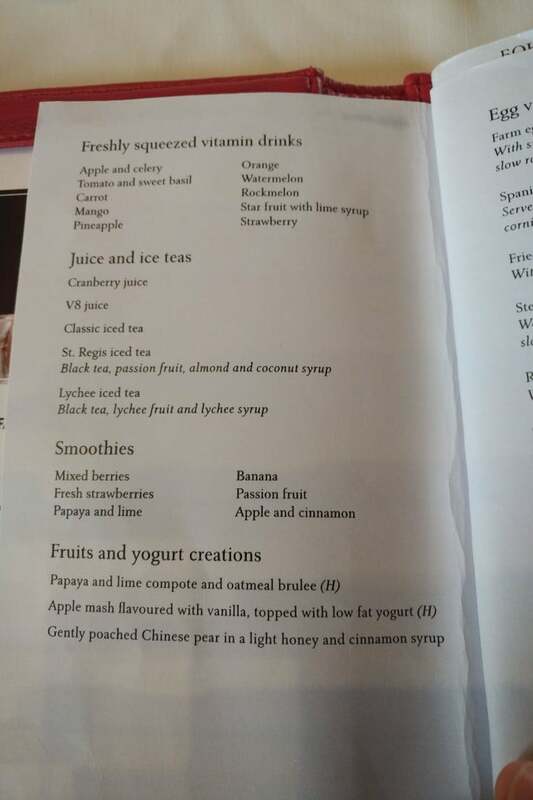 Could you confirm if the breakfast include champagne or prosecco? you know, given that i’m so obsessive about this I can’t believe I couldn’t recall it offhand. But I went to check my photos, and gasp horror, there was NO sparkling wine at all!